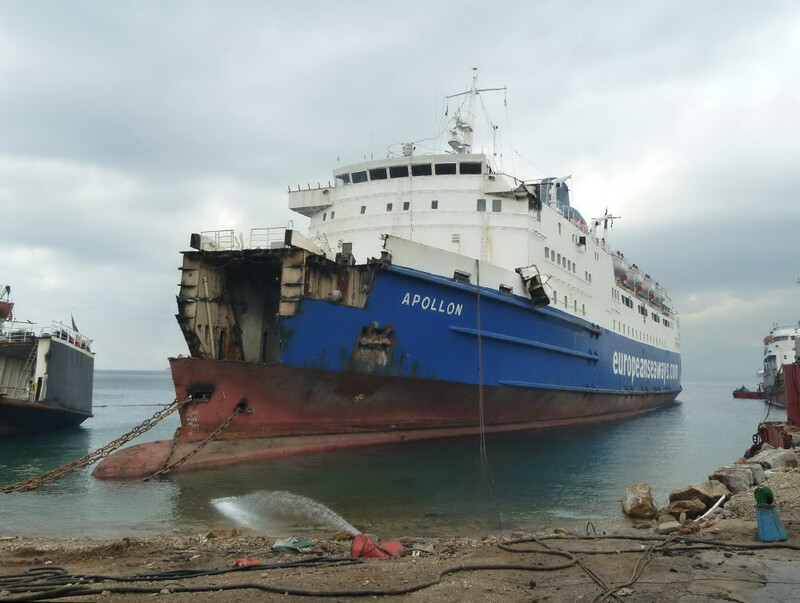 Despite her regrettable demise, one cannot hide from the fact that the Apollon was in rather ropey condition in her final few years. 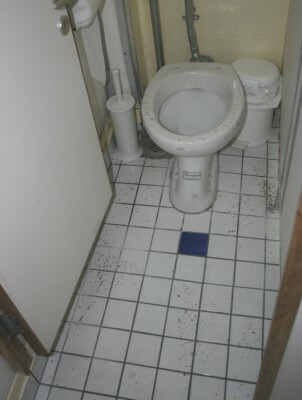 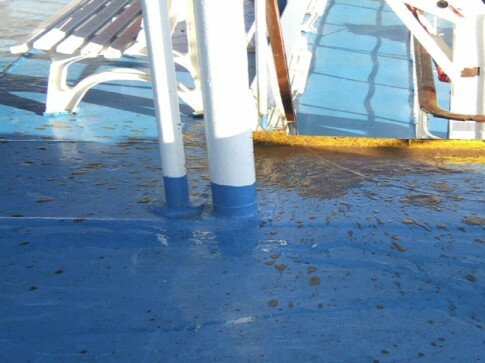 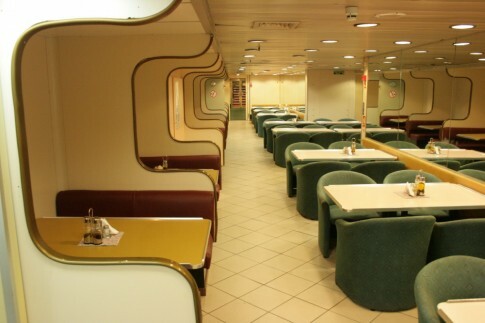 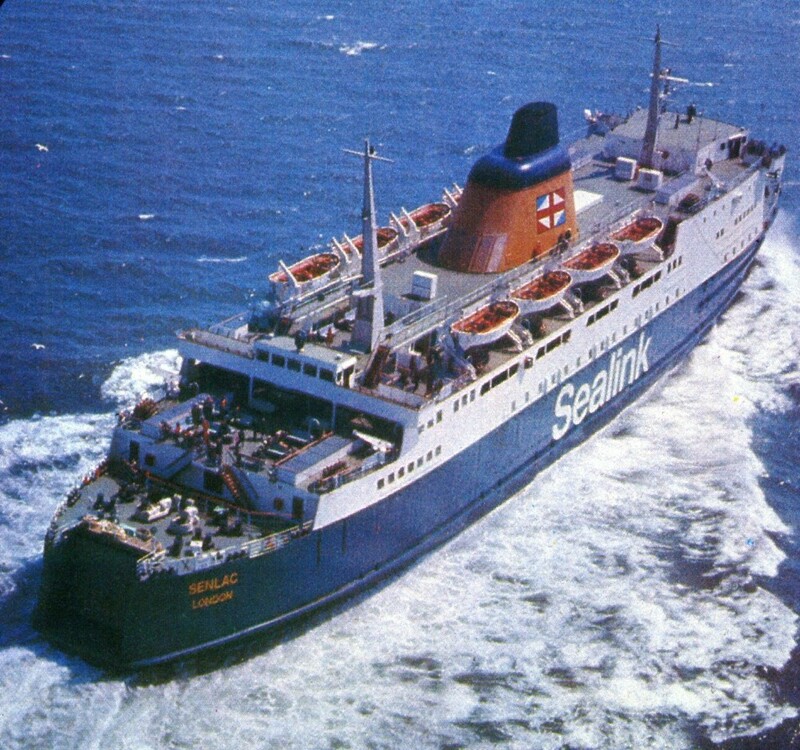 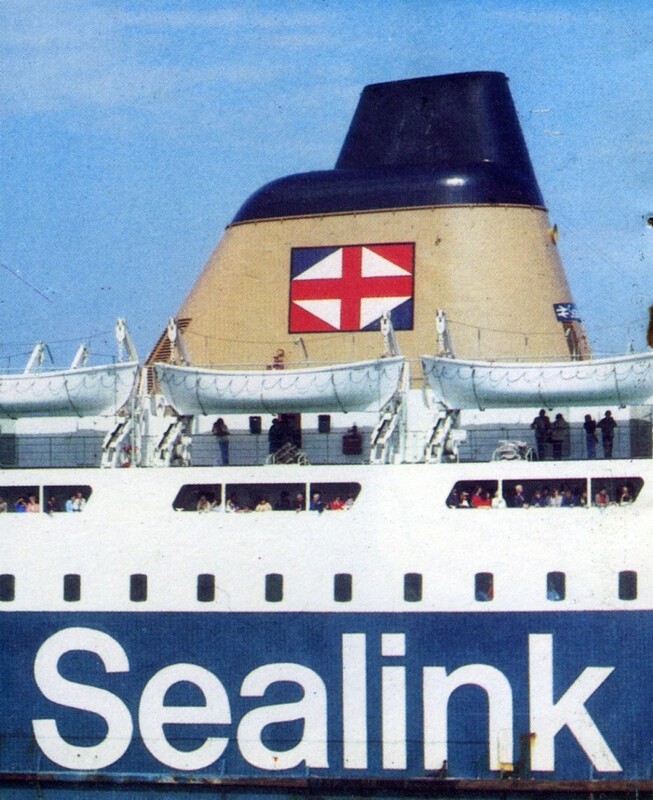 However, if one overlooked the exploding toilets and scratched under the surface the former Senlac was, in fact, probably the best ‘preserved’, in terms of fixtures, fittings and artworks, remaining ex-Sealink ship operating in Southern Europe. 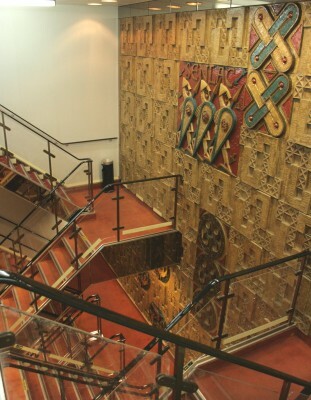 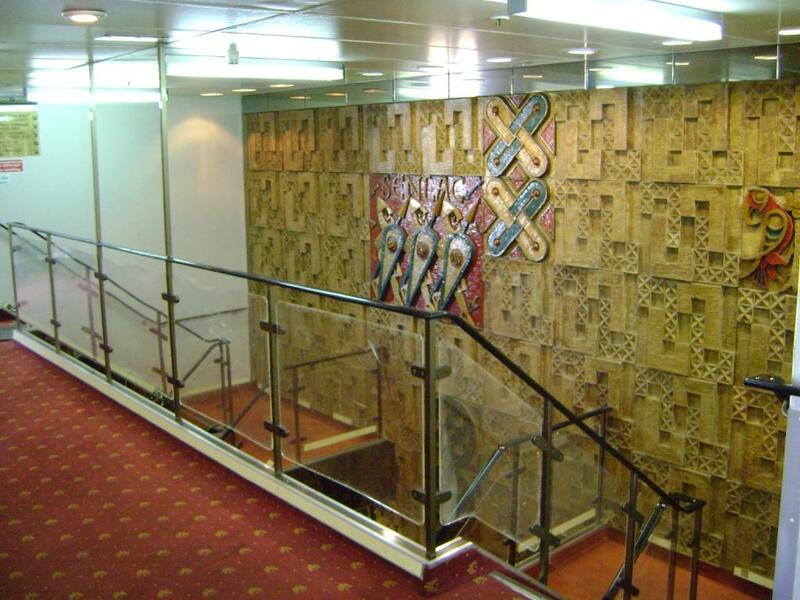 Starting with the best bits - the ship retained to the end in her forward stairwell the two and-a-half deck high fibreglass mural by the Czech sculptor Franta Belsky. 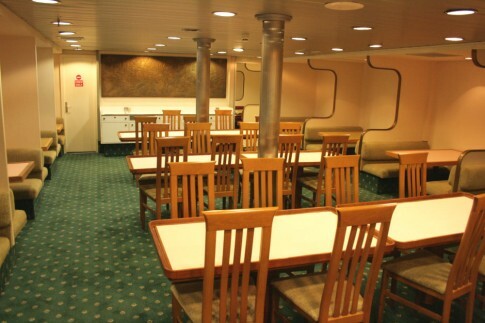 The cafeteria with carved-out booth seating. The ship's restaurant, new chairs apart, was largely unchanged from built - the bas relief panel on the aft bulkhead featured stylised scenes of the Battle of Hastings from the Bayeux Tapestry whilst, beneath it, the waiter station is also original. 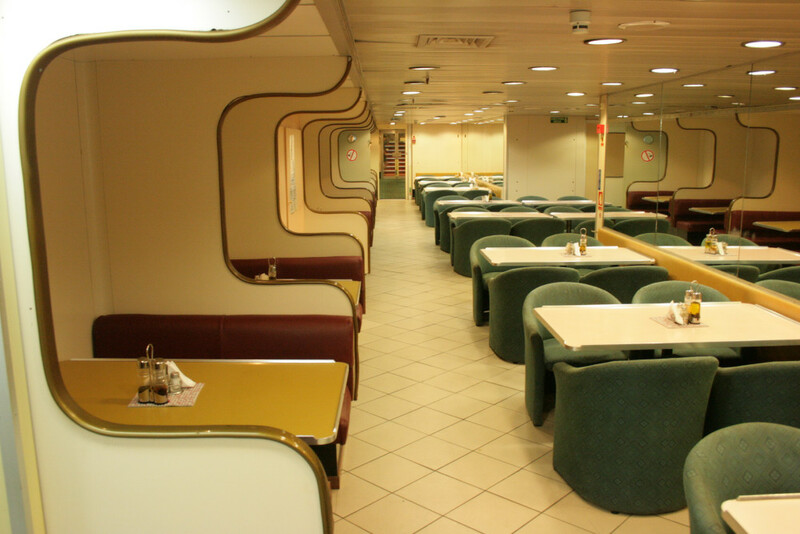 One of those original restaurant chairs had migrated to this former officers cabin, forward, latterly in passenger use as a suite. 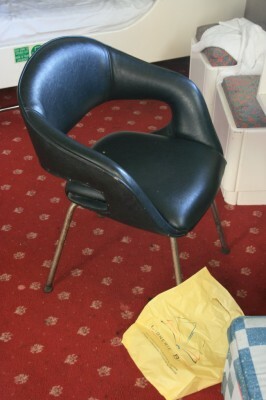 In contrast, this chair, alas, was now at the end of its useful life. 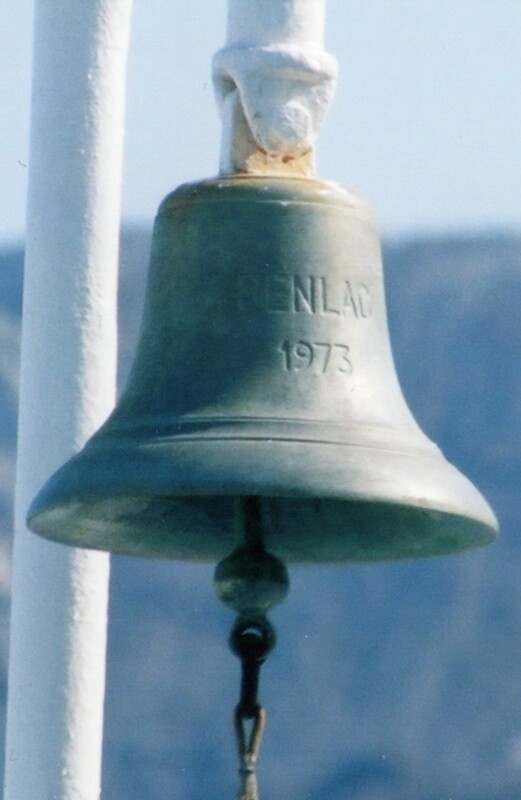 The ship's bell, inscribed 'SENLAC 1973', disappeared after her Hellenic Seaways service ended in 2005. 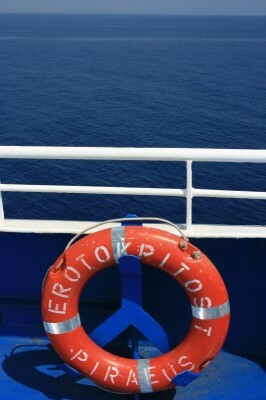 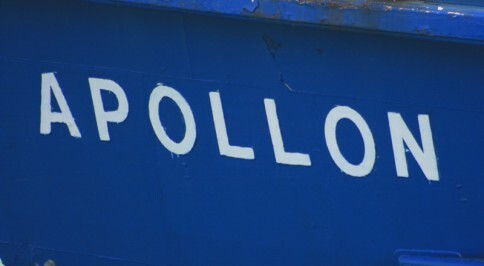 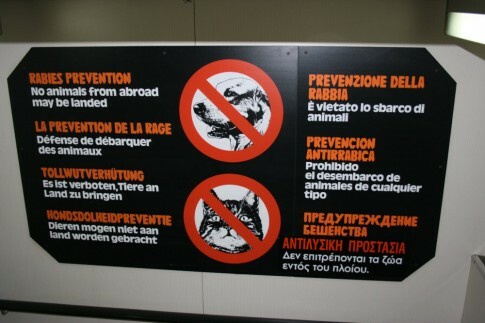 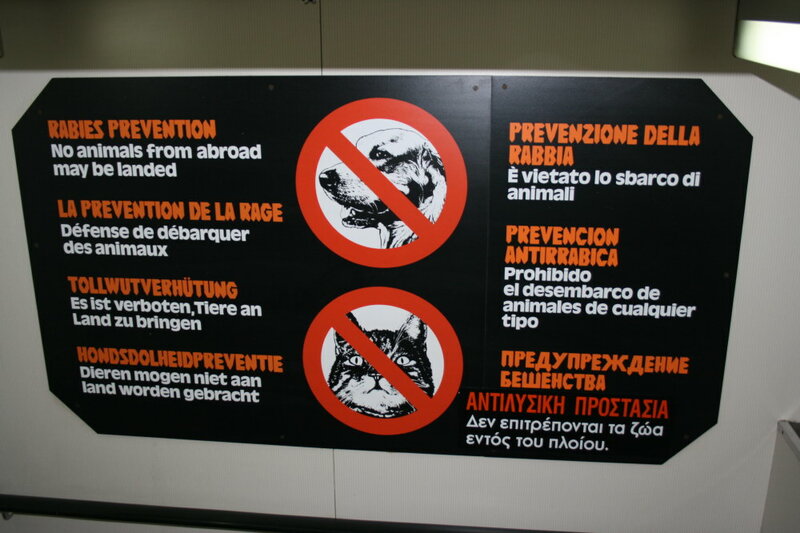 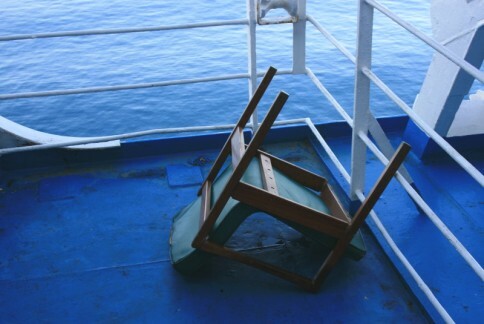 Seen on board the Apollon is the now empty mounting. Did I mention the ship had plumbing problems? 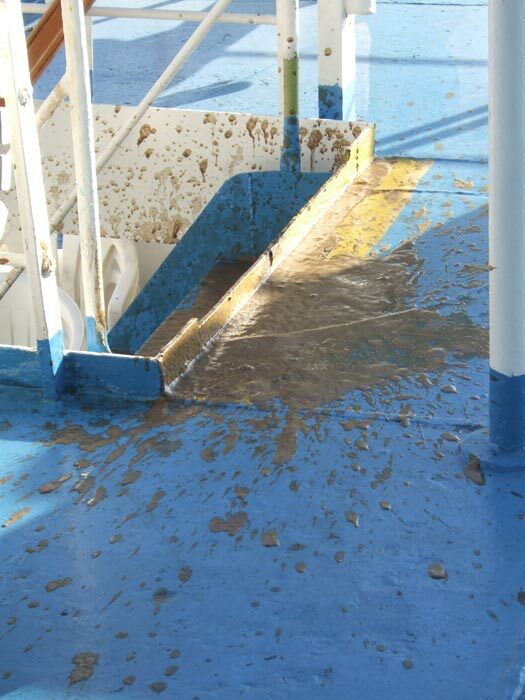 My old chum Bruce was quicker than I to capture this sewage overflow pipe fulfilling its titular duties. 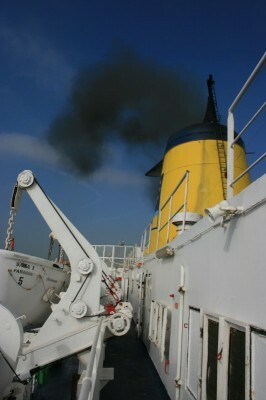 Picture courtesy Bruce Peter. I don't know what they were feeding the Apollon in the end but she could, like many of her Albanian consorts, certainly belt out thick, fairly pungent smoke. 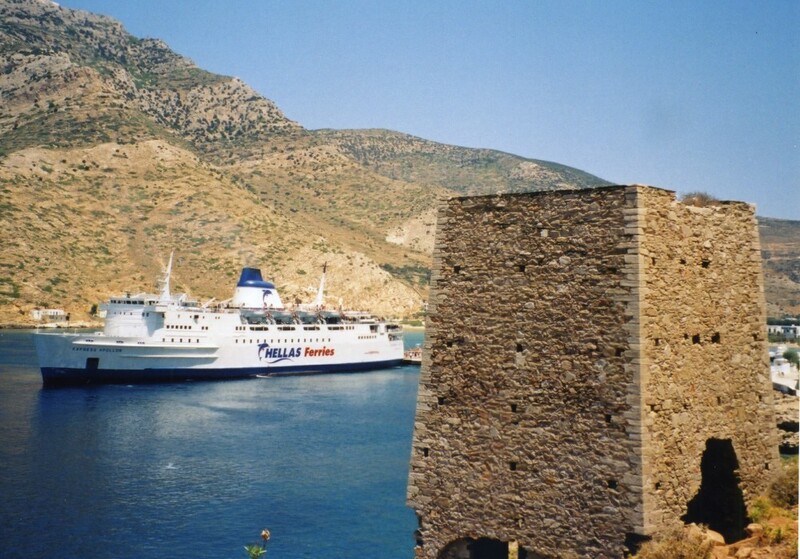 Lastly, we cannot let the chance slip by to have a morbid look at the Senlac’s end in Aliaga, Turkey. 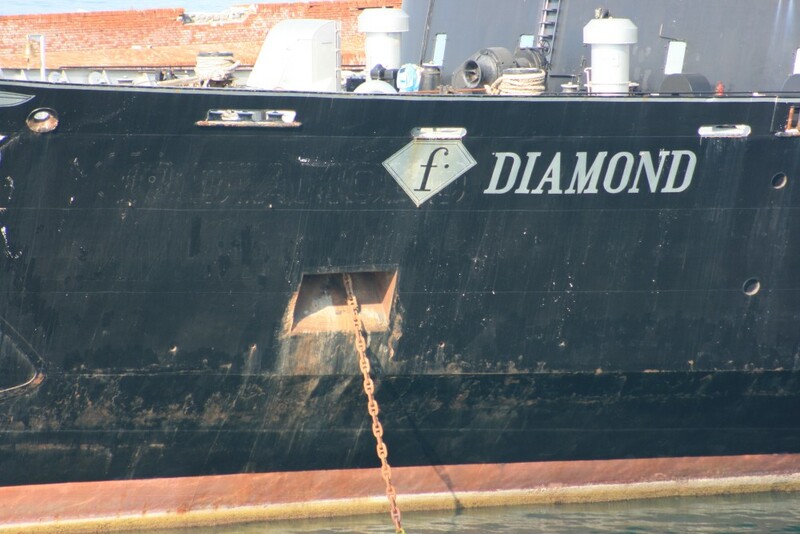 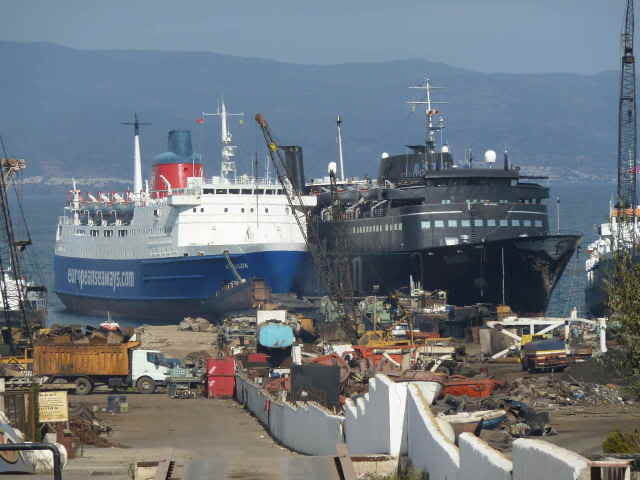 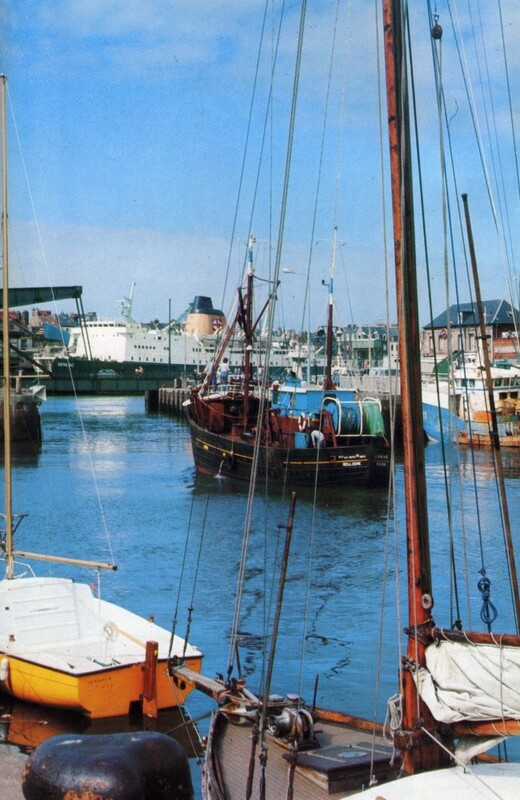 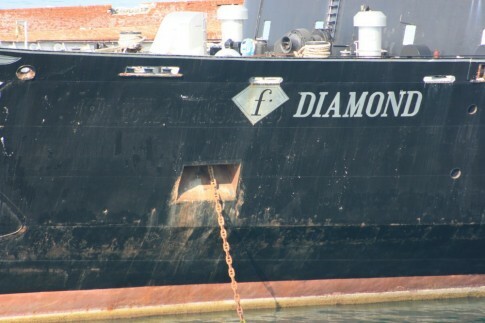 The photographs by and copyright of Selim San require no real comment but note that the ship, originally next to the all-black F Diamond (ex-Tor Hollandia) is actually being broken up at a different location having been re-sold between breakers. 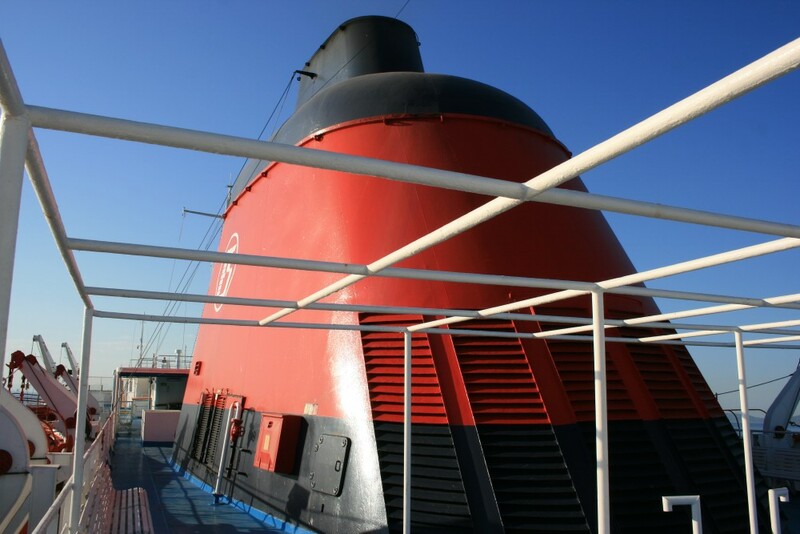 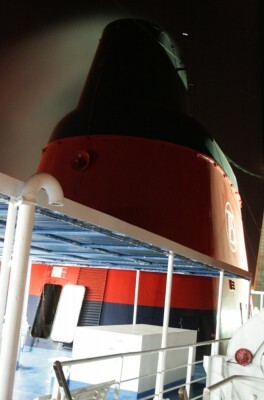 In the process she has managed to have her port side bridge wing completely ripped off – it can be seen hanging over the forecastle. 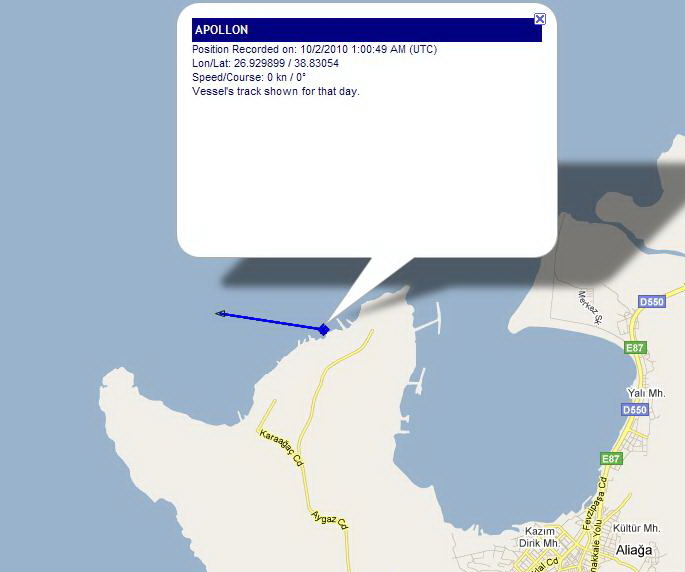 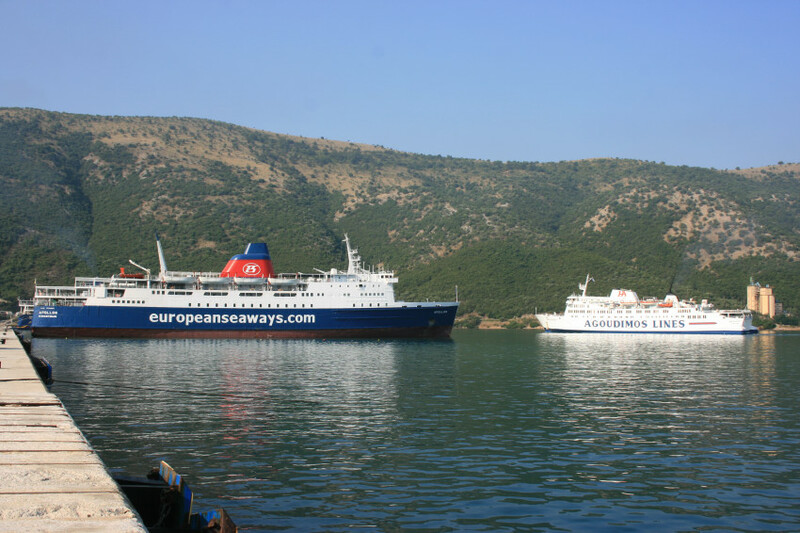 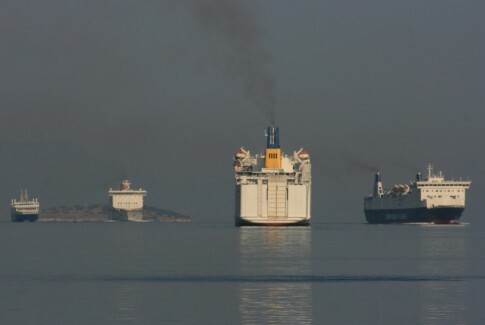 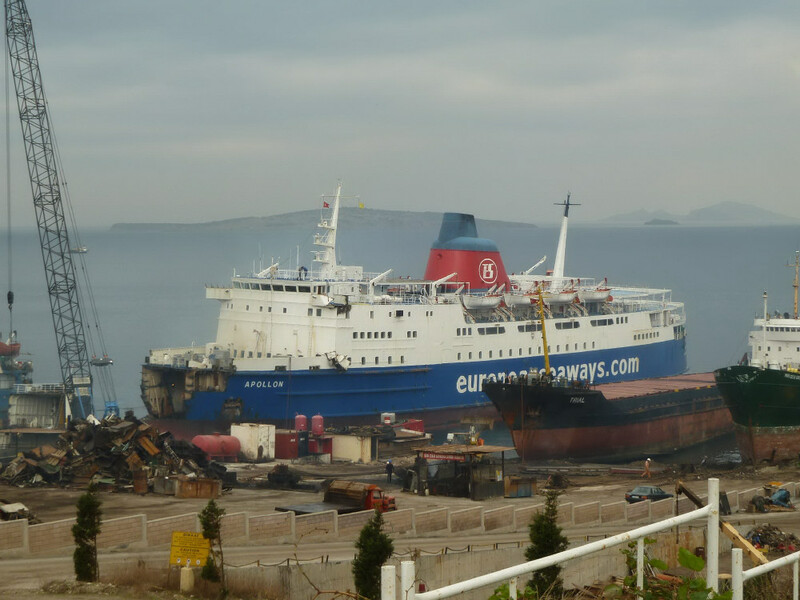 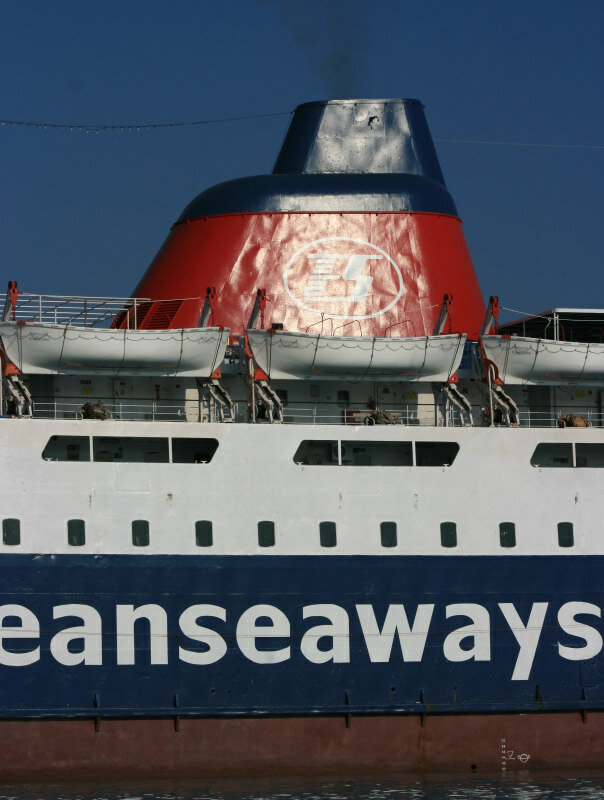 With minimal warning, the Apollon of European Seaways sailed for scrapping at Aliaga in Turkey on Thursday morning. 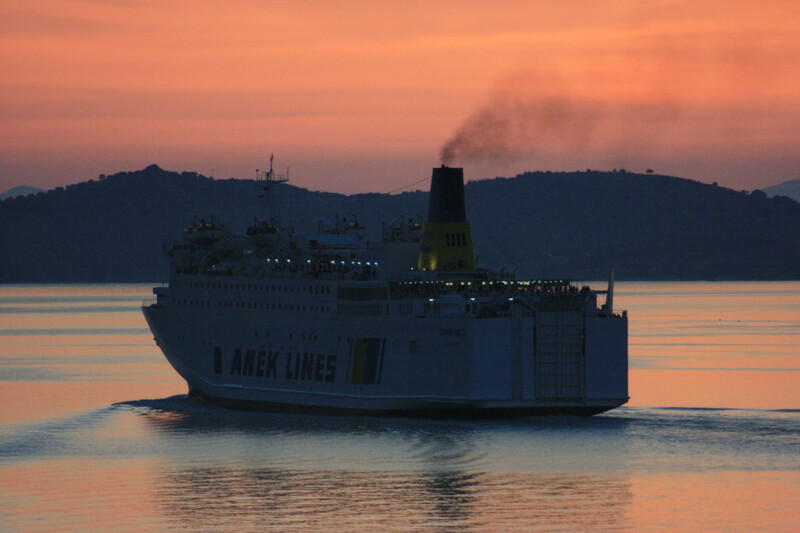 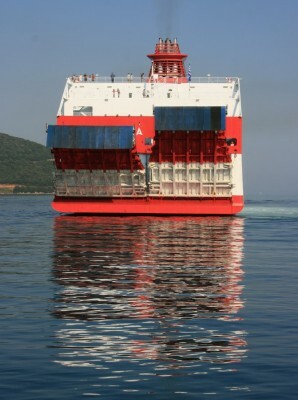 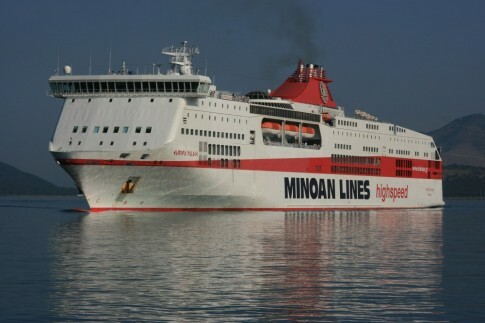 Her final scheduled sailings on the Bari-Durres run were in mid-September, after which she retired to Salamis near Piraeus for a final lay up prior to departing one last time. 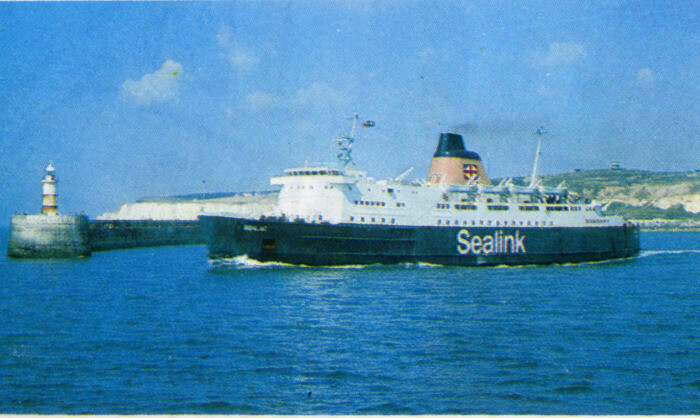 Originally the Senlac of 1973 the ship was the last of a trio for cross-channel services to be built by the naval dockyard in Brest. 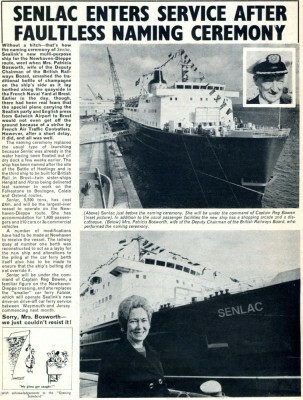 As outlined in The Senlac Story (which will be updated for the final chapter shortly) whereas her sister ships Hengist and Horsa were destined for Dover and Folkestone service, the Senlac was always intended for Newhaven-Dieppe and inherited the convoluted ownership structure of ships on that route. She was, however, resolutely British in terms of operation and manning – at least until January 1985 when the British Sealink sold up and she was transferred to the French flag. 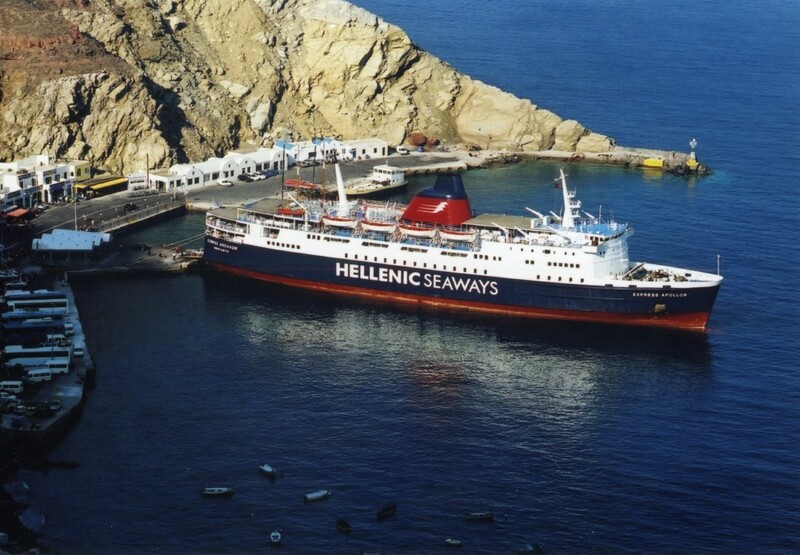 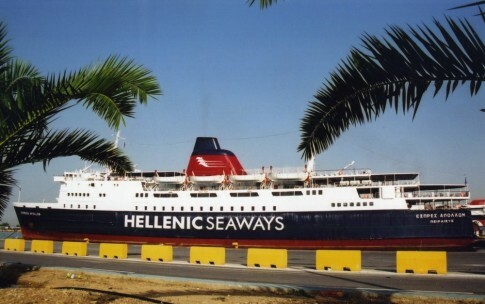 A sale to Greece in late 1987 opened up the second chapter in her career – she became an incredibly successful and popular ship in domestic traffic with, successively, Ventouris Sea Lines, Agapitos Express Ferries and Hellas Ferries/Hellenic Seaways. For many years she was one of the primary ships on the key route from Piraeus through to Santorini and, after a couple of years away from this role, returned to the service for one last, brief, Summer in 2005. 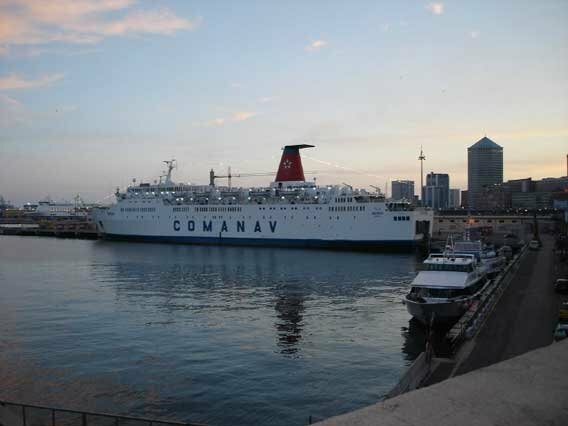 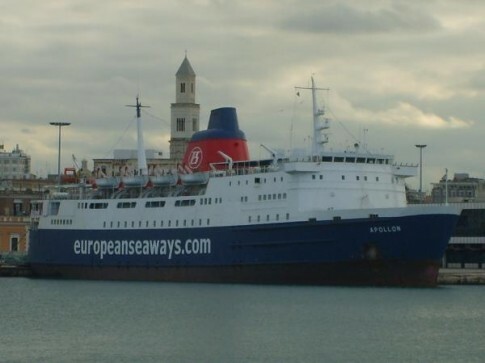 Her final owner was the Arkoumanis family, behind the long-standing fringe Adriatic operator European Seaways. 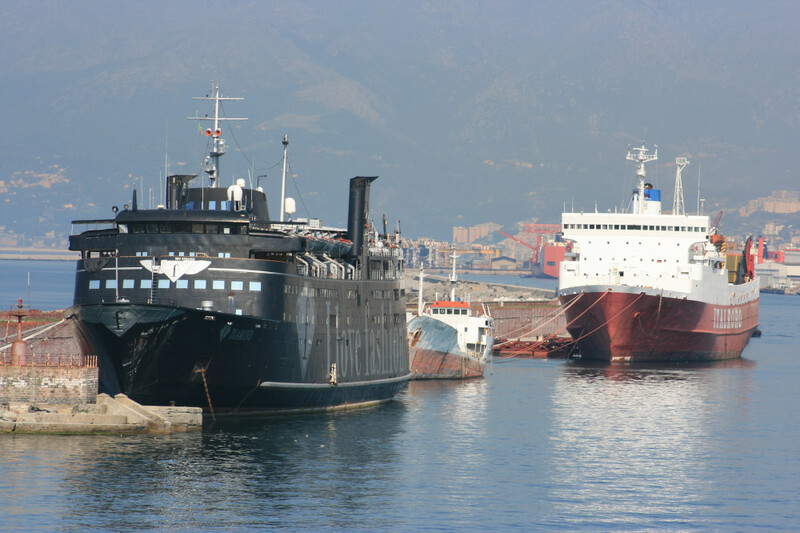 At first she was used on sporadic services between Italy and Greece before, in 2009, being deployed to Durres in Albania out of the Italian port of Bari, latterly alongside the ex-Japanese Ionis. 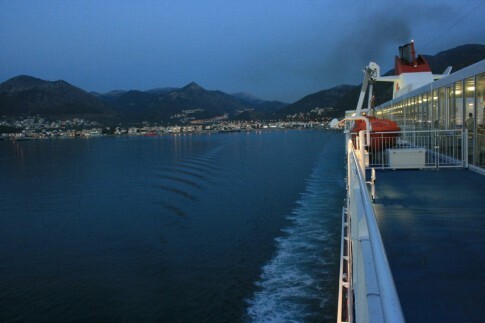 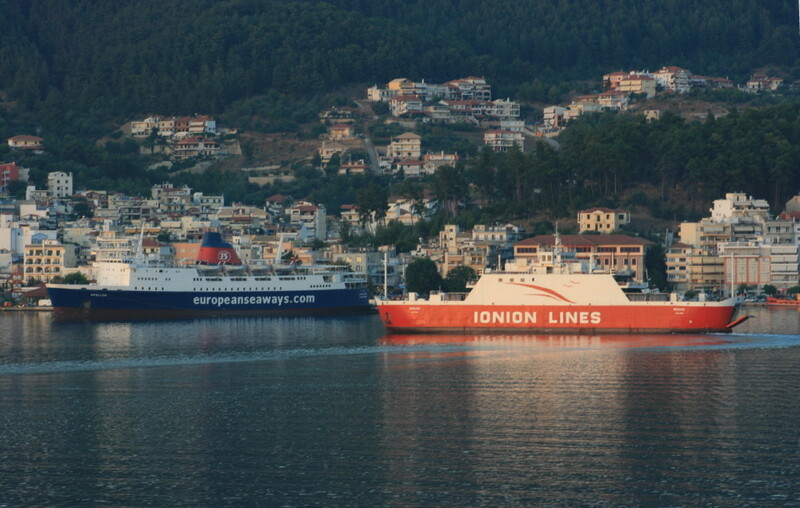 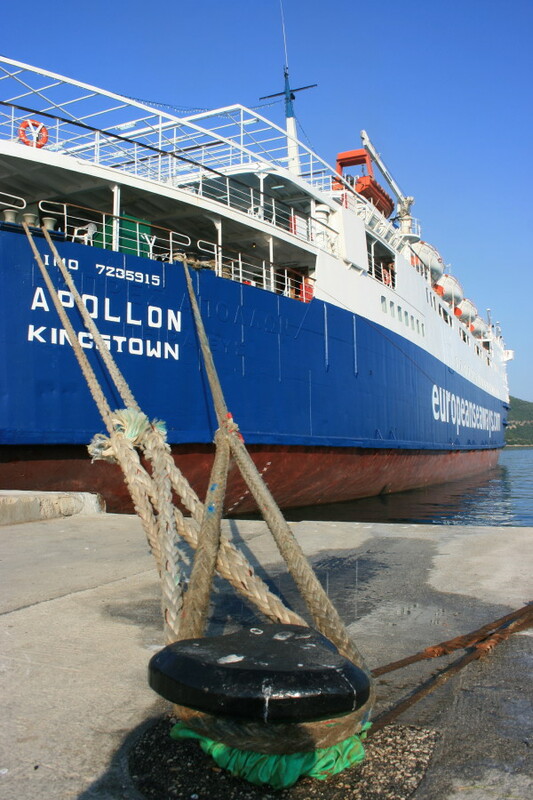 Occasional sailings to Greece continued but the Albanian routes more often than not form the final part of a ship’s career – and so it was with the Apollon. The ship was latterly in somewhat poor mechanical health and this seems to have forced her owners’ hand – certainly it does not seem to have been a long-planned decision to let the ship go at this point in time. 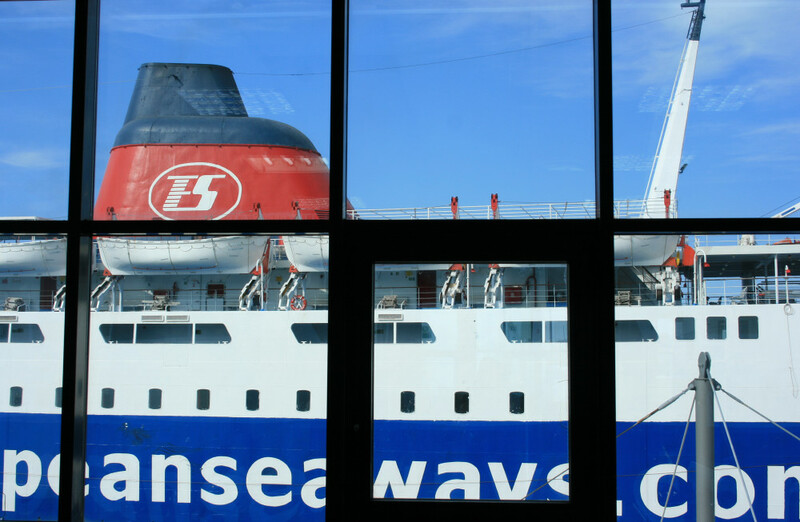 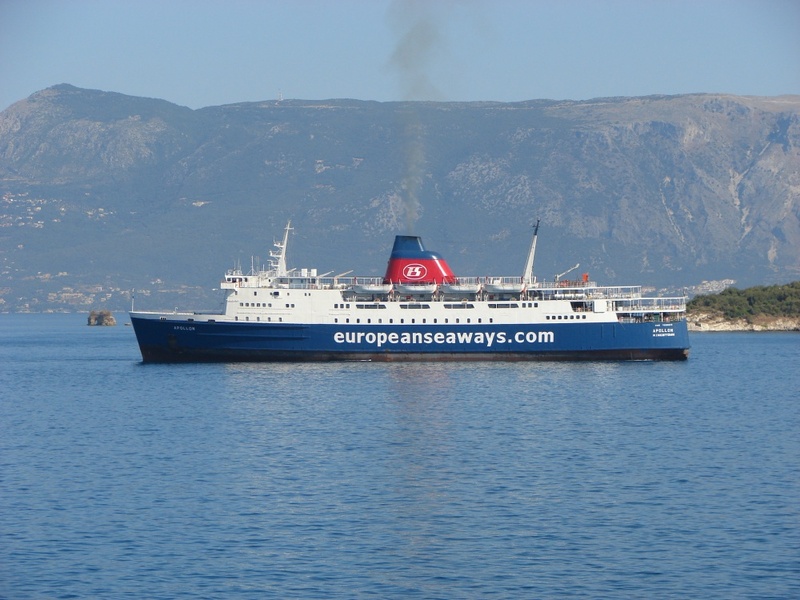 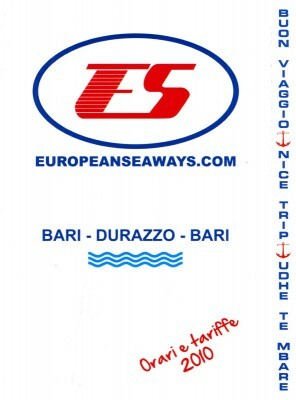 The 2010 timetable on the European Seaways website still shows her reappearing in December to offer additional sailings over the Christmas period. 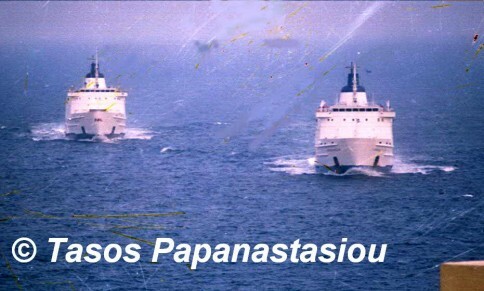 On the newly released 2010/11 schedule, these are now pencilled in for the Arkoumanis family’s other ship, the Bridge (ex-Bass Trader). 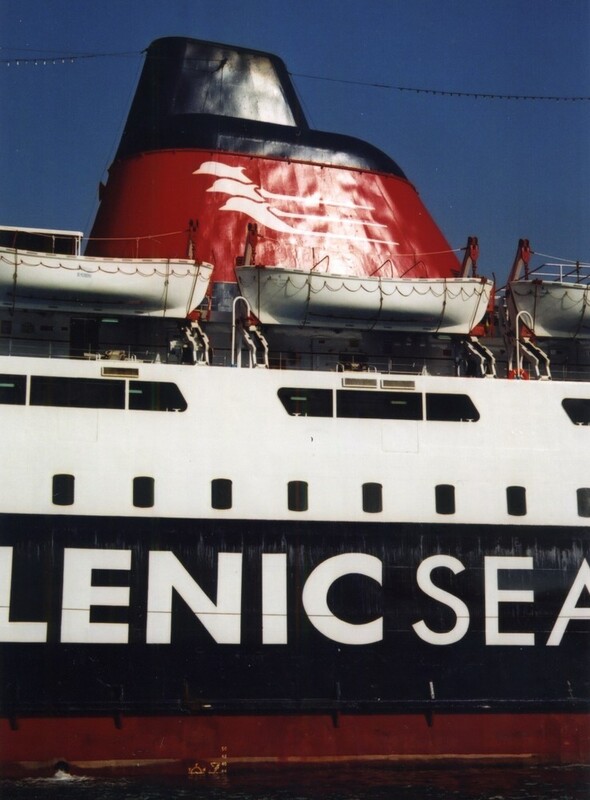 The Senlac’s demise can perhaps ultimately be traced back to her sale from Greek domestic service back in 2006 – and in some respects she paid the price for the continuing success of her sister ships. 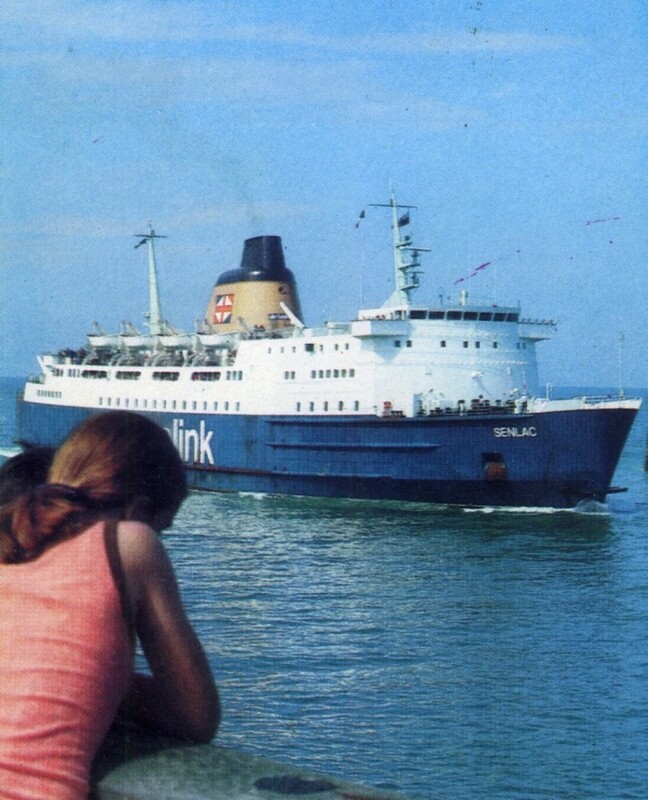 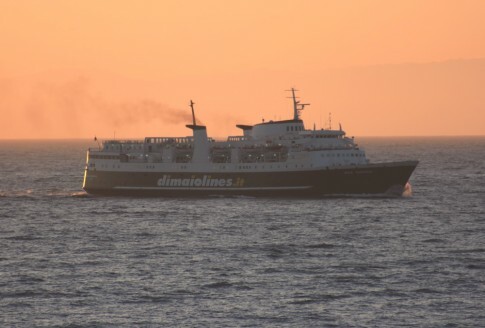 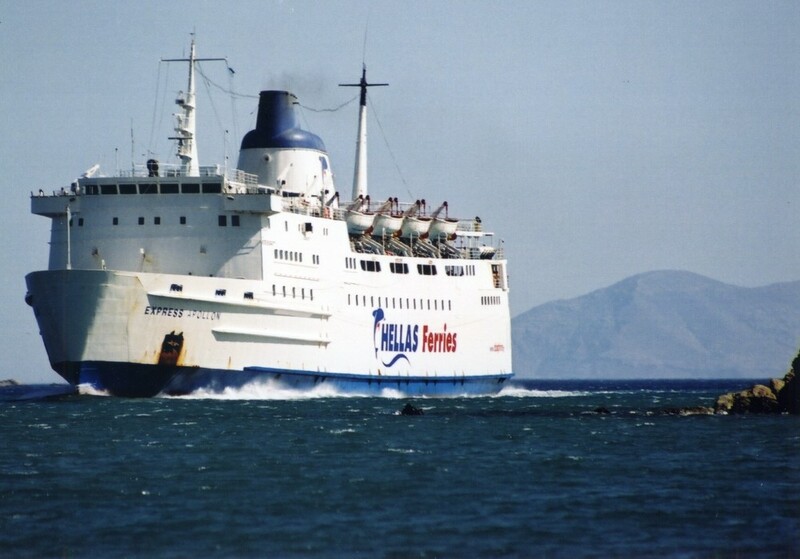 When the former Hengist and Horsa were sold in early 2004 to rival domestic operators, Hellas Ferries were soon kicking themselves as they were used in competition against their own ongoing services. 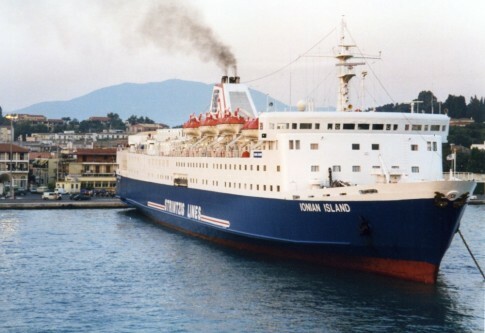 This class of ship is almost perfect for Greek island hopping service and Hellas Ferries were determined, when the time came, to dispose of the former Senlac to an operator who would not use her in a competing trade. Unfortunately the Apollon was never entirely suitable as an overnight ship on the Adriatic and her mechanical fragility sealed her fate. 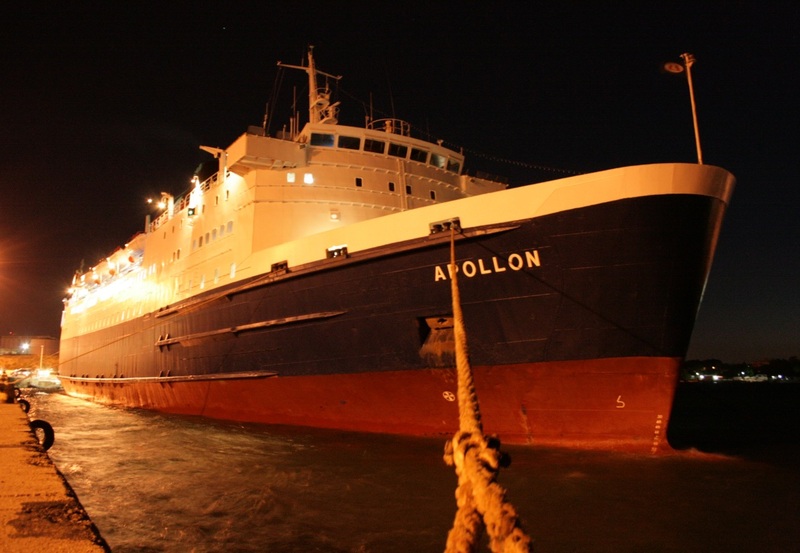 Those intermittent mechanical gremlins didn’t, however, prevent the Apollon sailing to Aliaga under her own power, topping 17 knots at times as she sped to meet her doom. 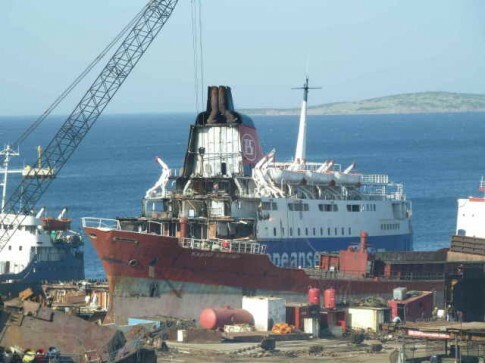 Presented below are a few reminders of what was, despite the sudden end, the long and memorable career of a very popular ship. 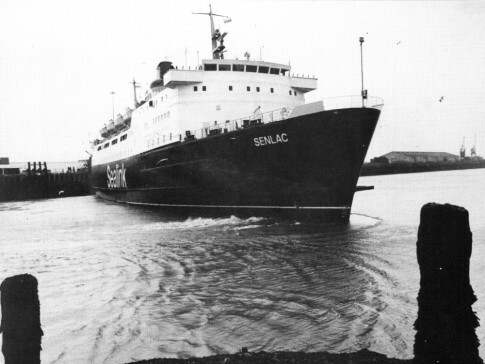 The Senlac swinging at Newhaven. The Senlac’s career spanned a period of massive transformation in the transport networks between the United Kingdom and France. 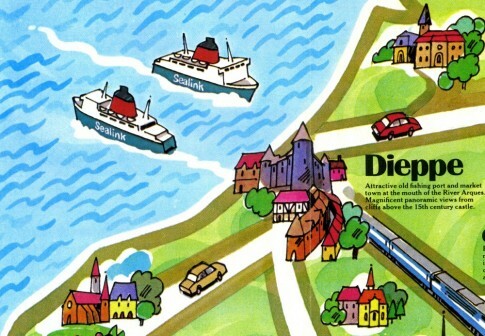 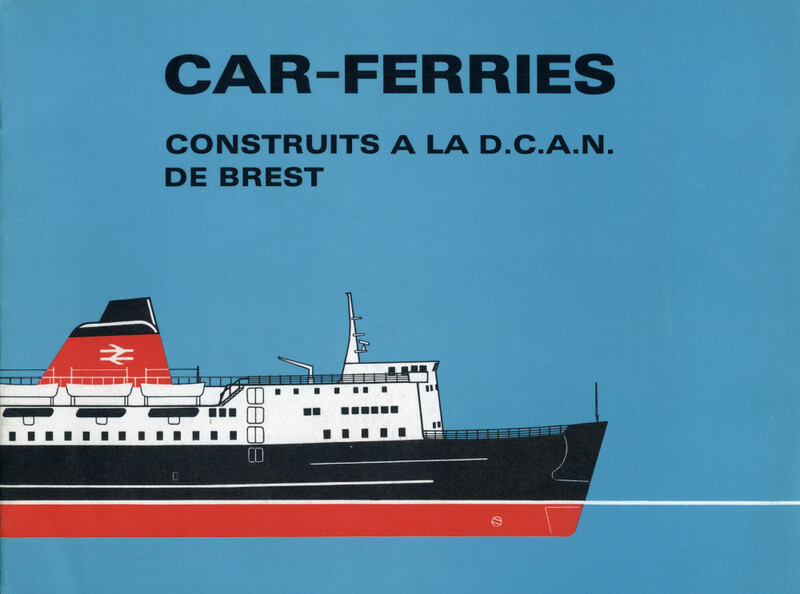 The Newhaven-Dieppe brochure (above) from the year of the ship’s introduction offers passengers a 2202 departure from London Victoria which, via two boat trains and the 2345 Dieppe ferry, will get them into Paris Saint-Lazare in time for an early breakfast at 0625. 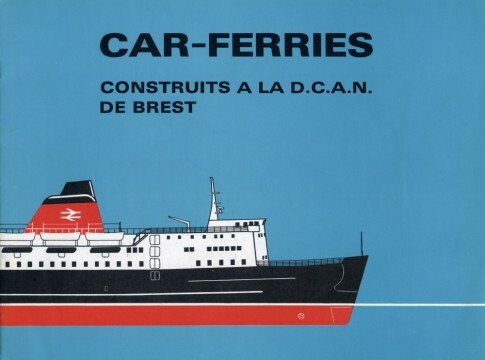 Cross-channel weather permitting of course. For over a century the Newhaven route remained a key link in transport connections between London and Paris yet today it all seems part of another world. The Senlac never received Sealink British Ferries livery but this leaflet (above), covering almost the final weeks of her career as a British ship, features the SBF name. 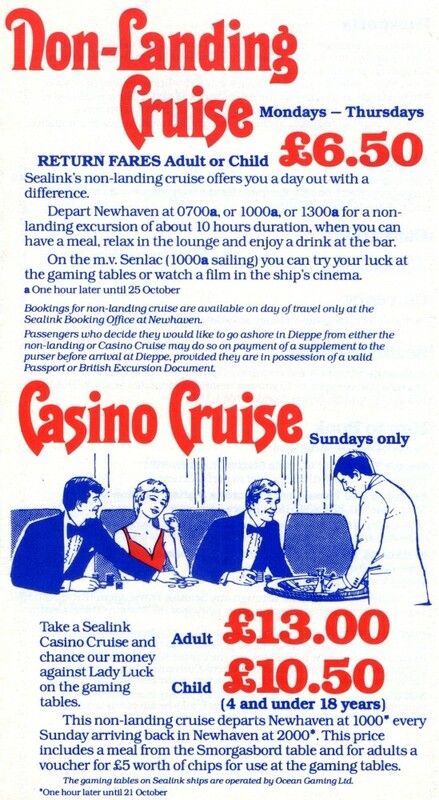 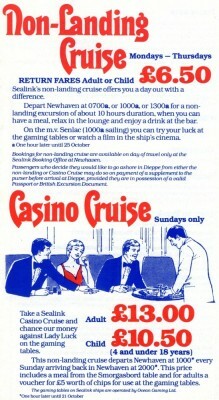 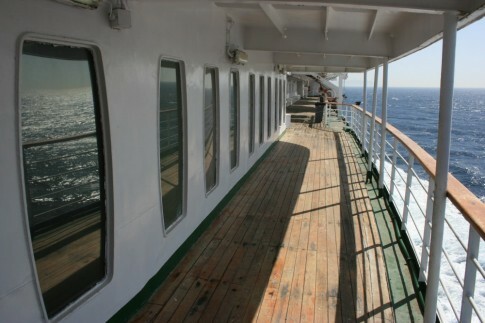 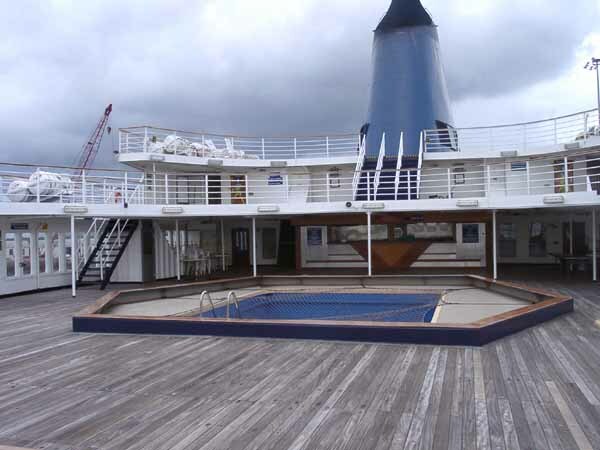 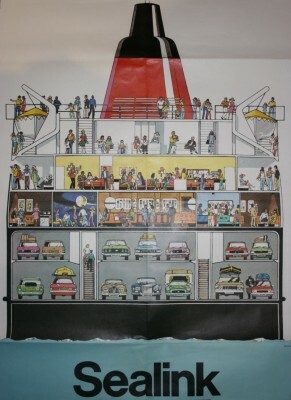 By this stage the ship was offering ‘Casino Cruises’ (below) – not available on the French vessels. 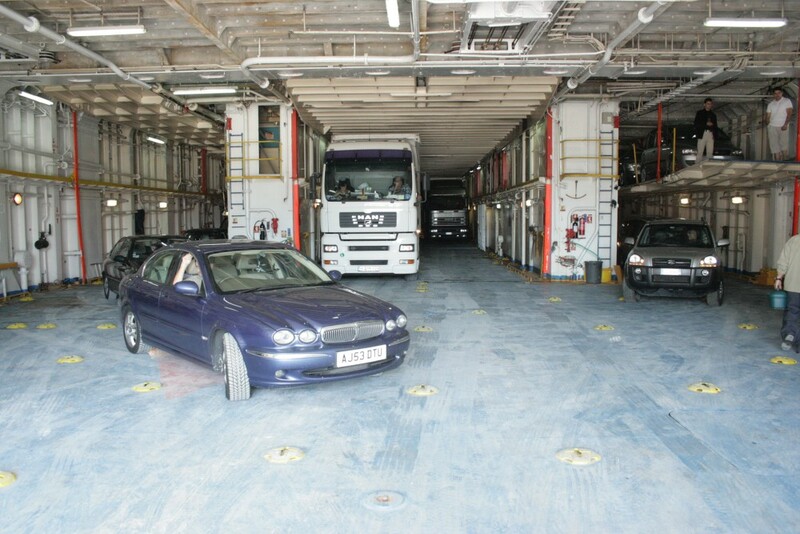 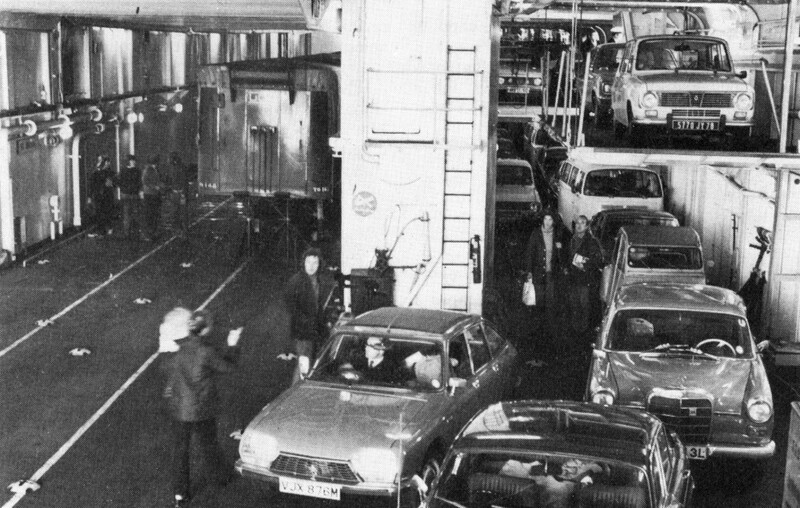 The ability of the careers of car ferries to span periods of vast social and technological change whilst themselves seeming to remain remarkably UNchanged can be demonstrated through comparative vehicle deck images. 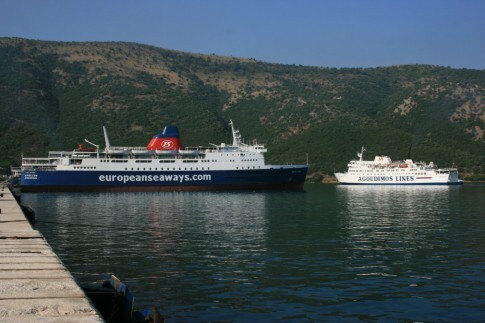 Above is the Senlac in 1973, below the Apollon in 2007. 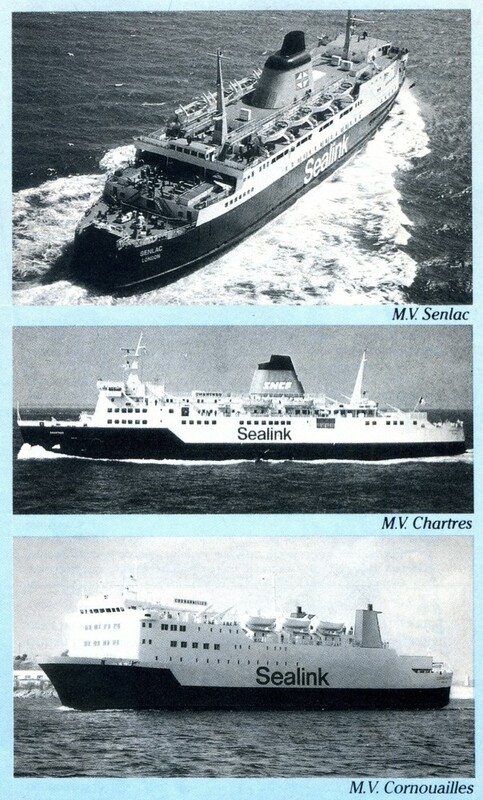 Although for her early years paired with the French 'V' ships, by 1984 the Senlac's Newhaven-Dieppe partners were the Chartres and chartered Cornouailles. 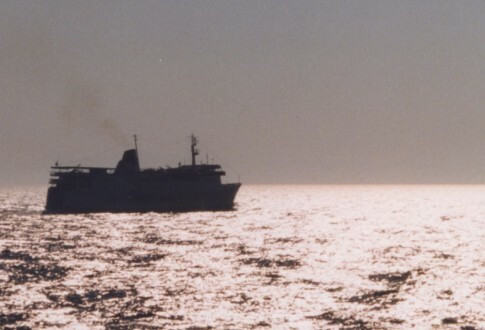 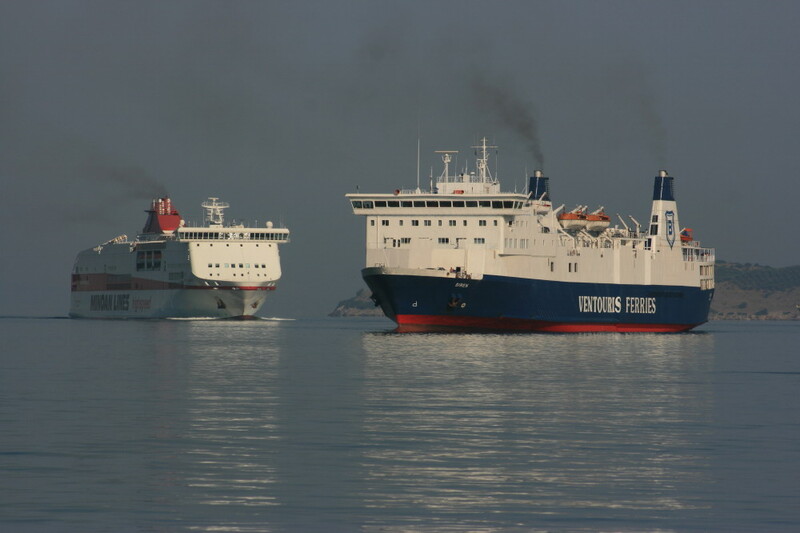 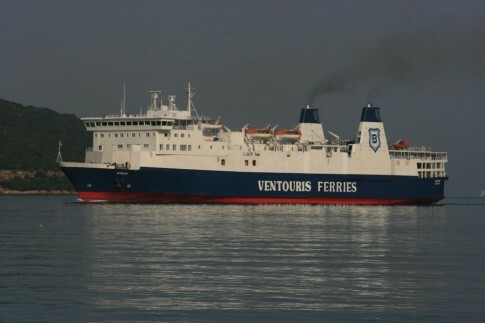 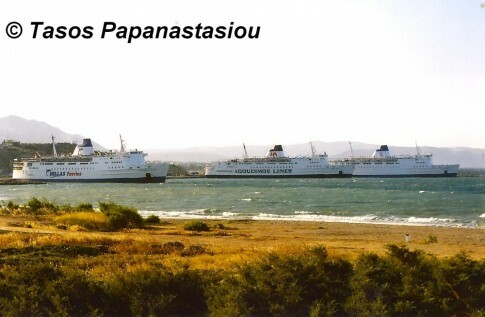 The Chartres followed the Senlac to Greece in 1993 and, three years later, the pair were reunited in the fleet of Agapitos Express after the demise of the Senlac's initial Greek owners Ventouris Sea Lines. 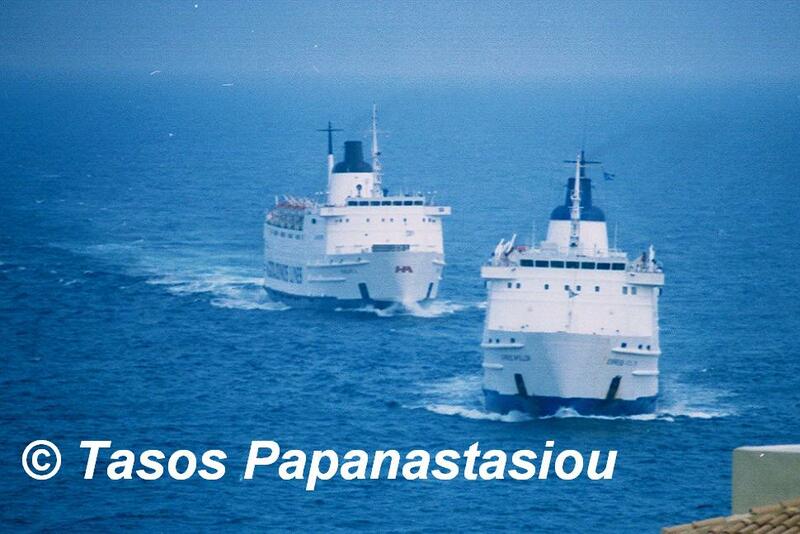 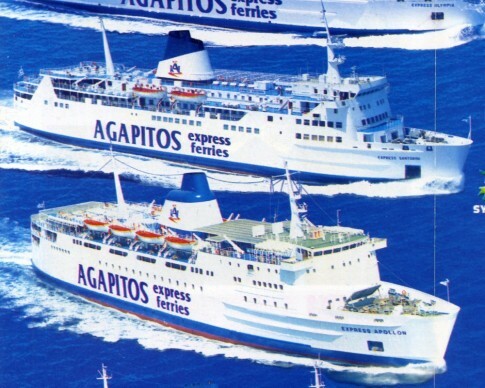 Together they formed a formidable partnership on the Piraeus-Paros-Santorini chain - as advertised here in the 1999 Agapitos Express brochure. 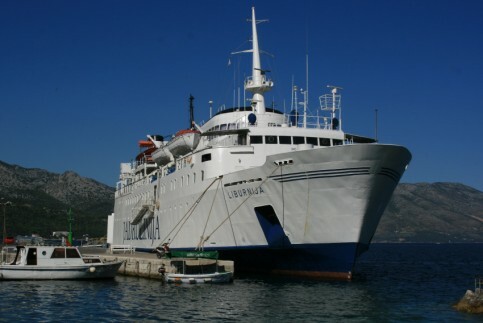 Latterly, the Senlac was also to be reunited with the Cornouailles which, as the Sveti Stefan, was often found on an adjacent berth at Bari in between her sailings to Bar in Montenegro. 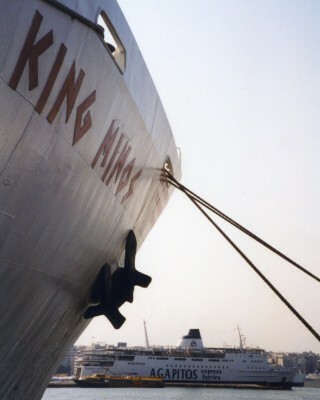 At Piraeus in August 1999, beneath the bows of Minoan Lines' King Minos. 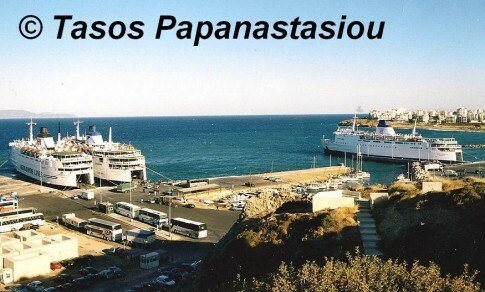 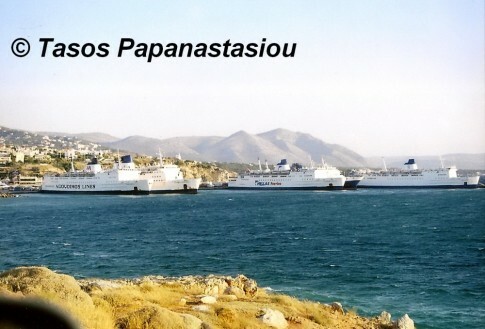 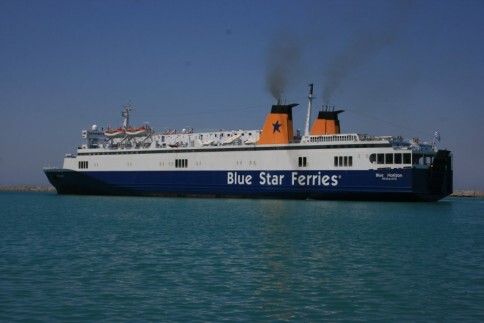 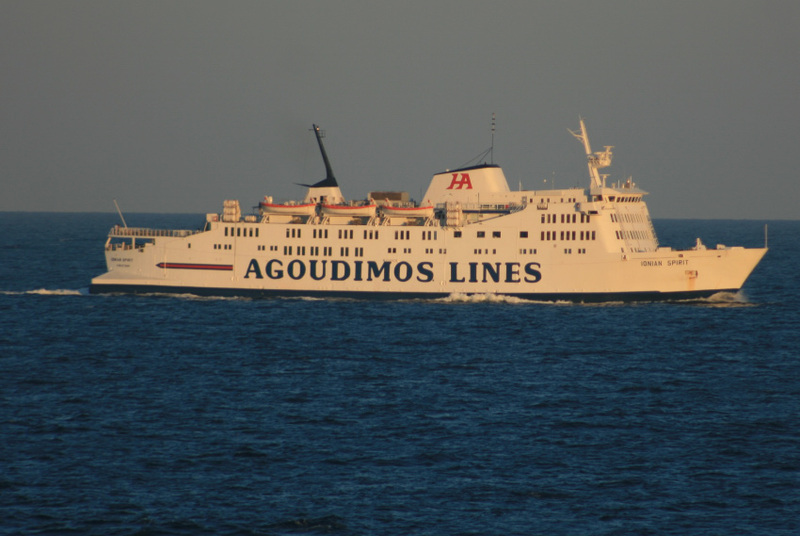 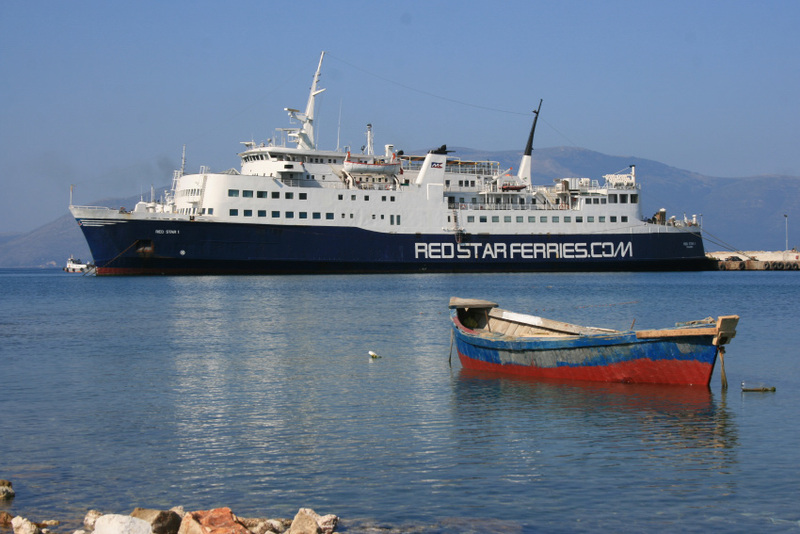 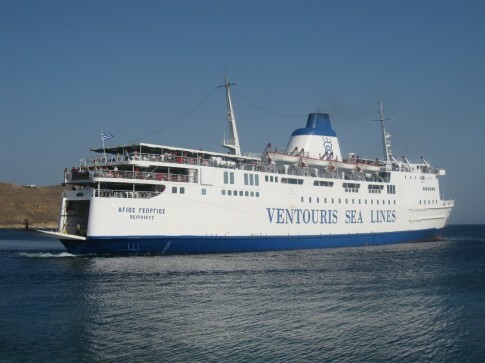 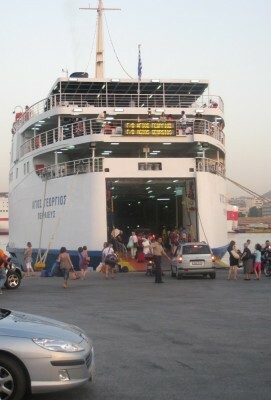 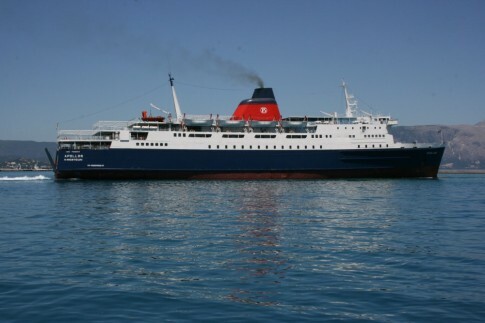 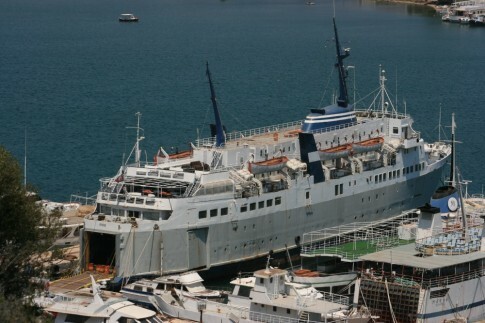 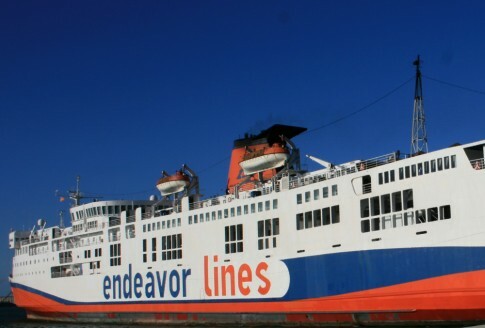 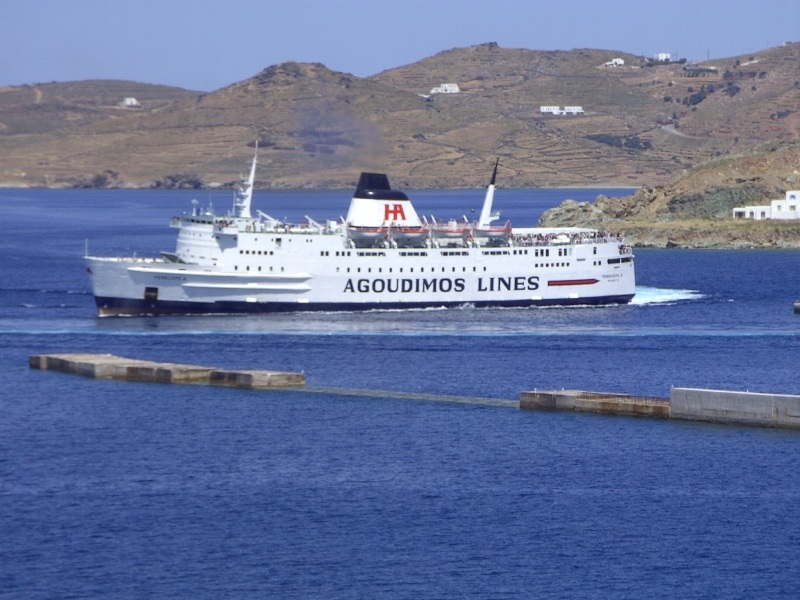 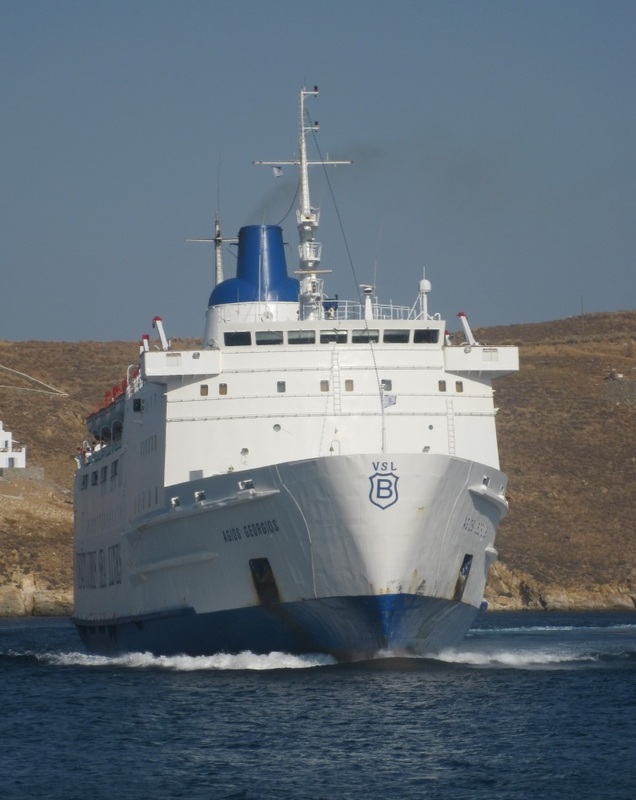 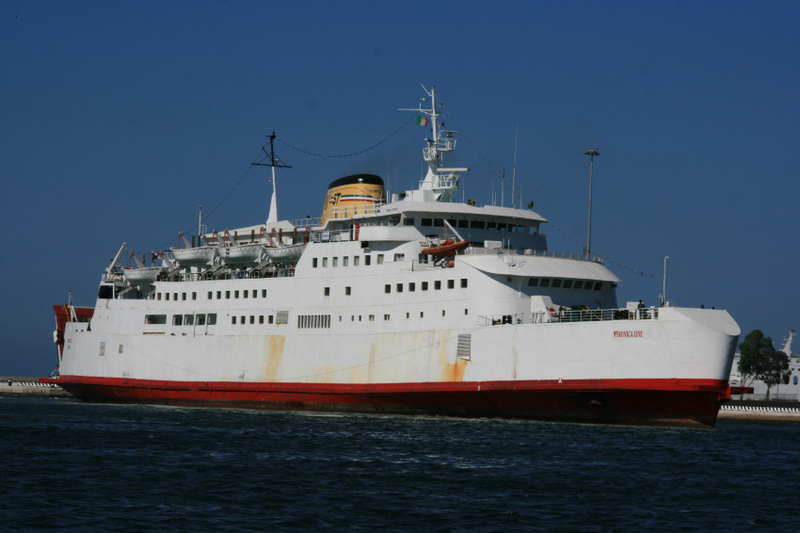 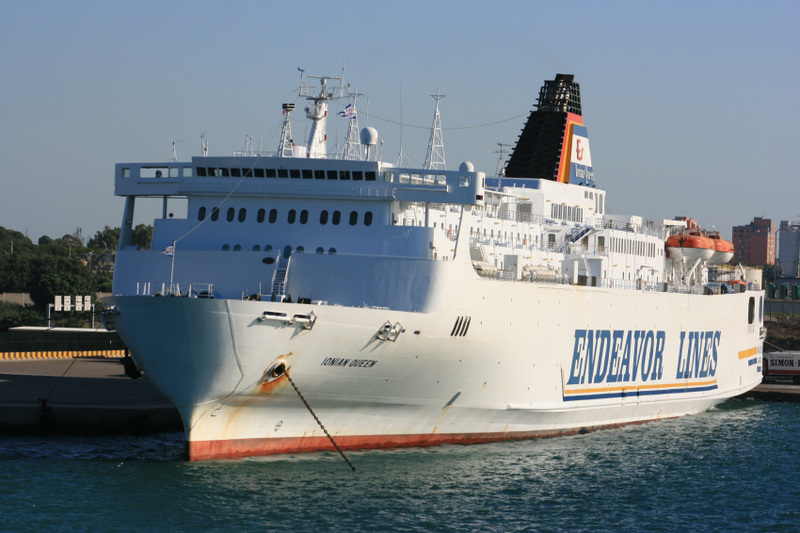 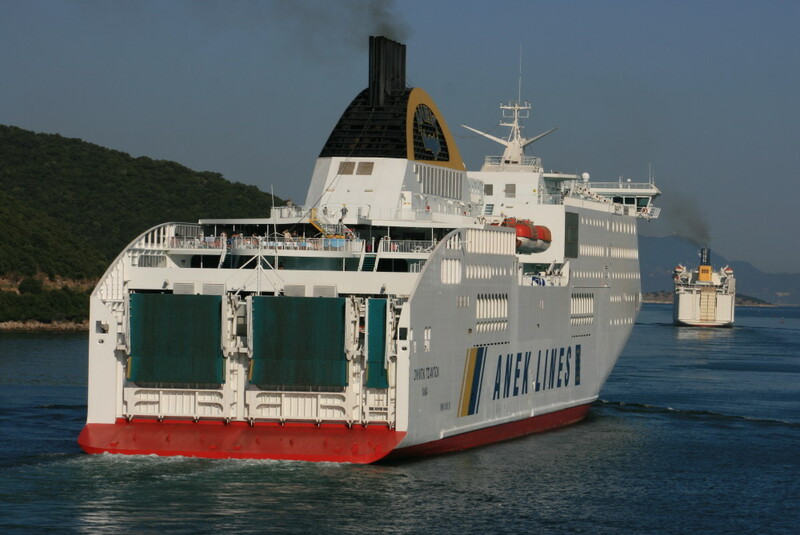 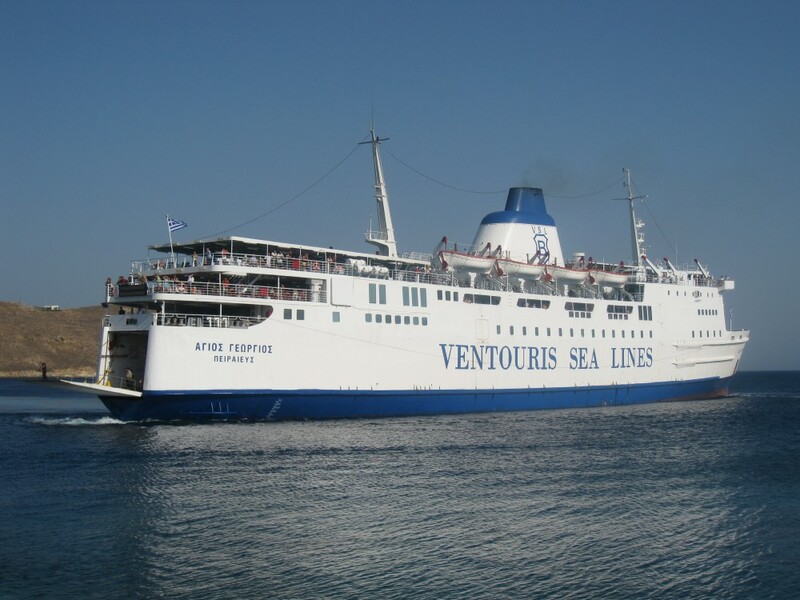 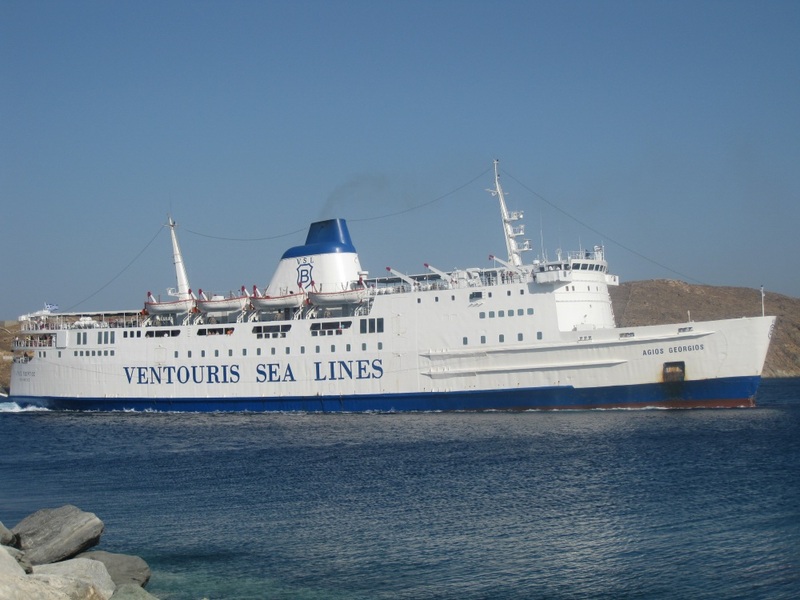 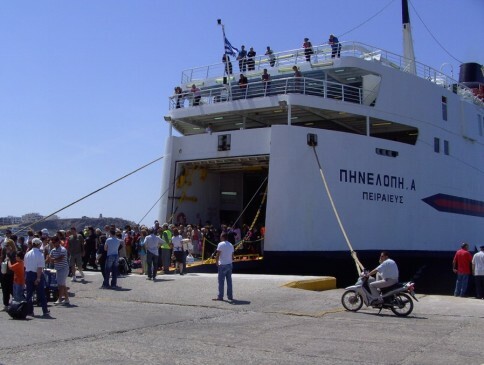 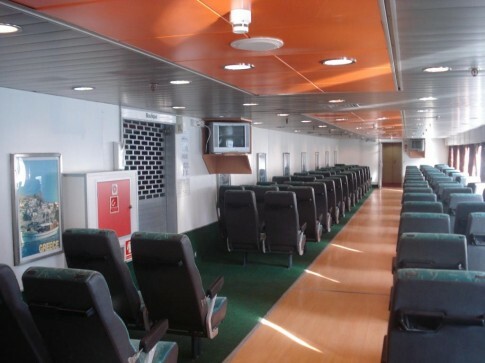 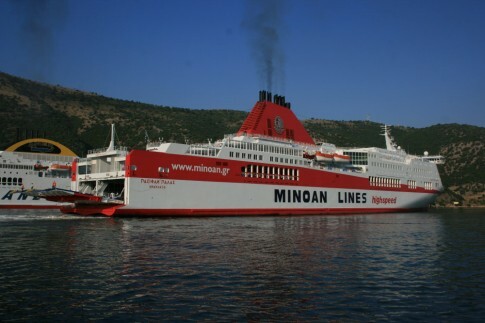 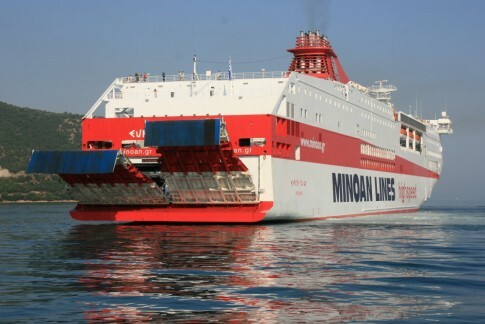 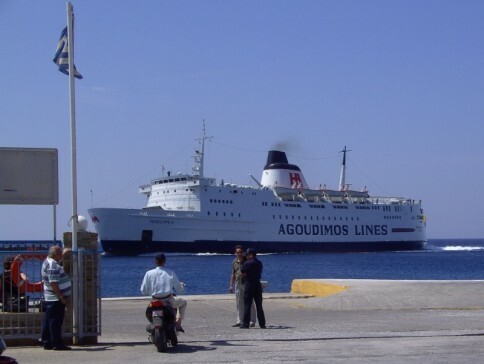 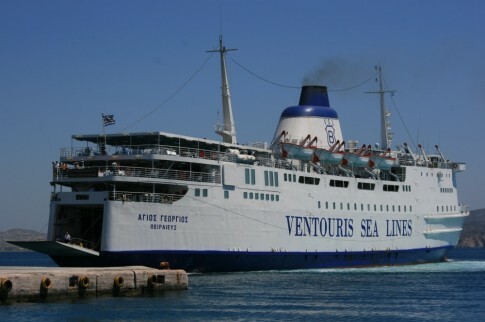 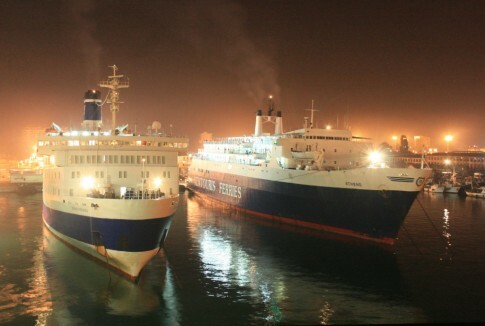 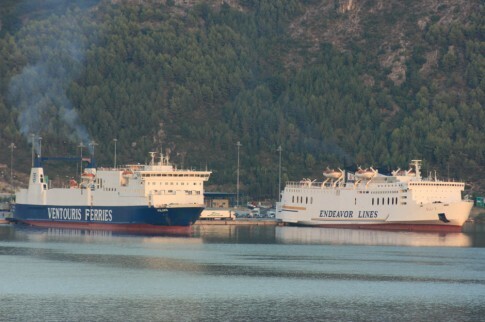 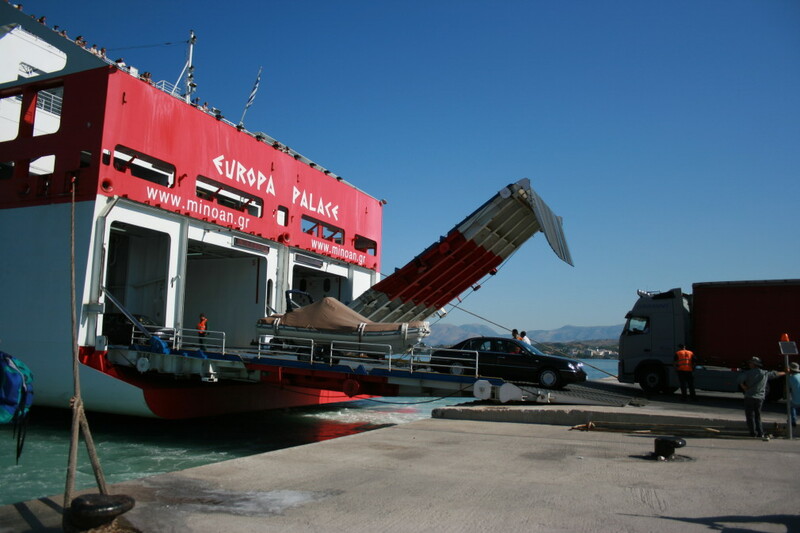 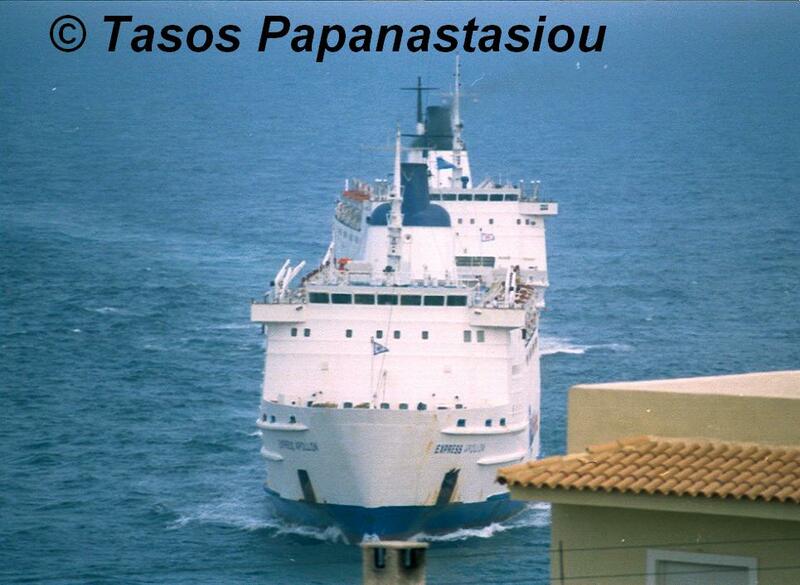 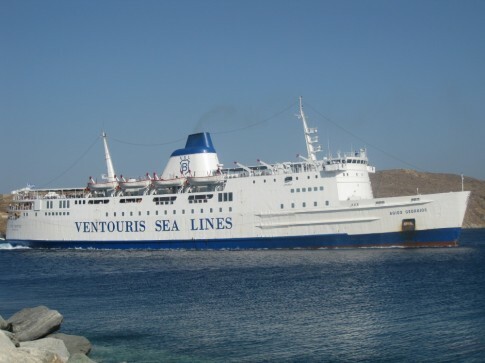 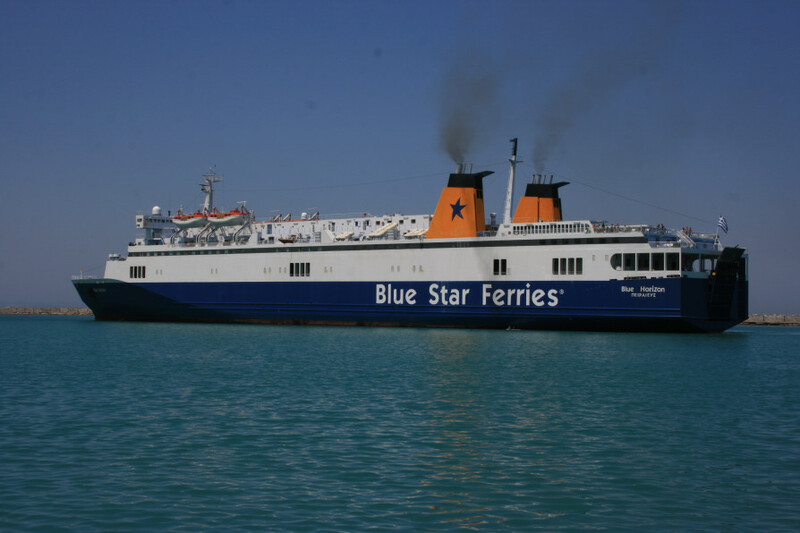 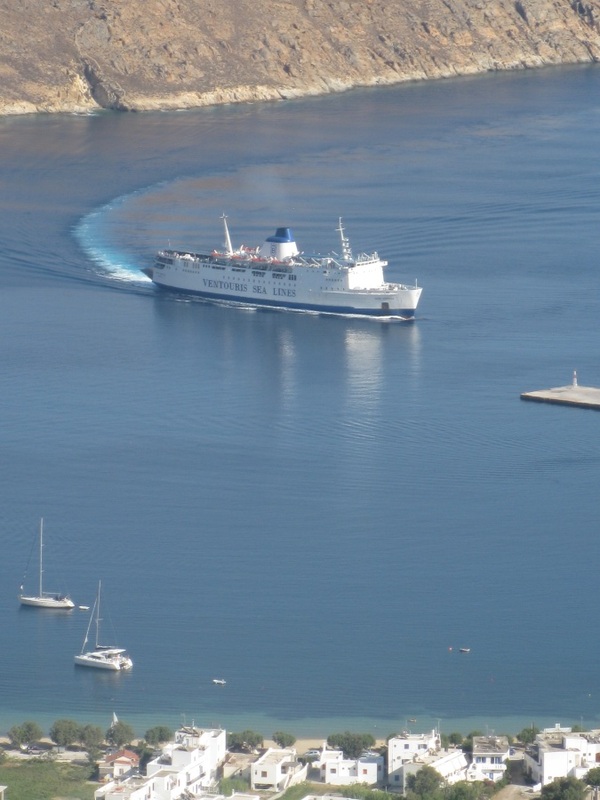 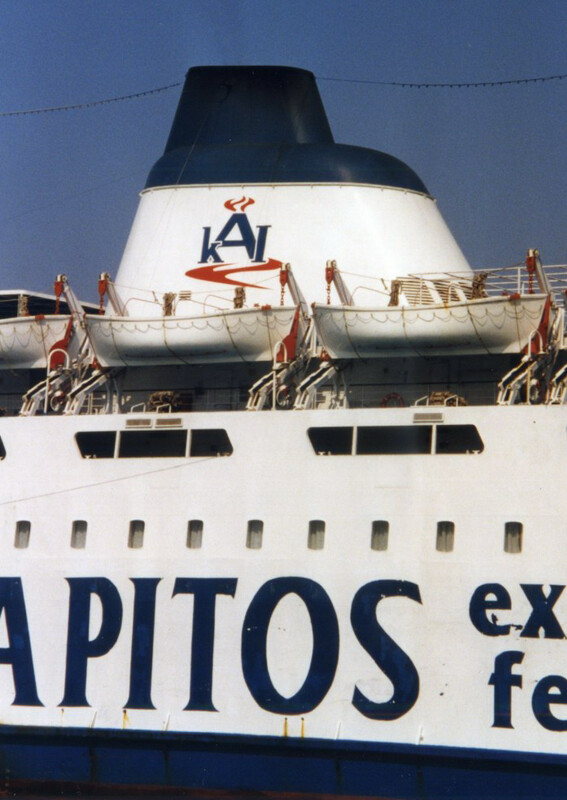 In late 1999 Agapitos Express was absorbed into Hellas Ferries and by the Summer of 2003 the Express Apollon could be found attempting to fill the shoes of the long-serving but recently sold Express Milos (ex-Vortigern) on the Piraeus-Serifos-Sifnos-Kimolos-Milos run; she is seen here at Sifnos. Ultimately the Vortigern's true long-term replacement would be the Senlac's sister the Agios Georgios (ex-Hengist). 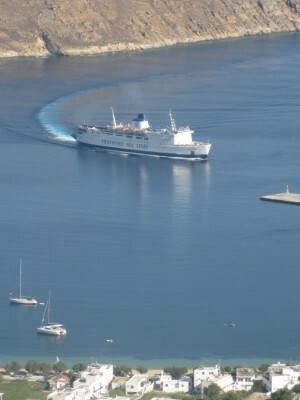 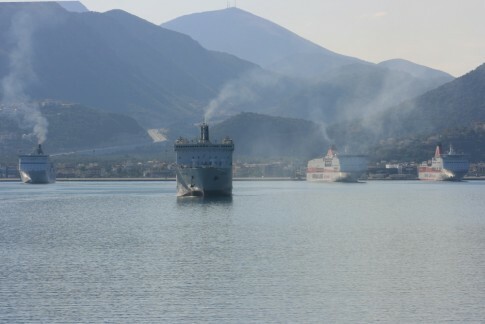 The Golden Summer of 2004 saw all three sister ships sailing for rival operators out of the secondary Athenian port of Rafina; the Express Apollon is seen here approaching the port of Gavrio on Andros. The Penelope A (ex-Horsa) chasing the Express Apollon into port, 2004. 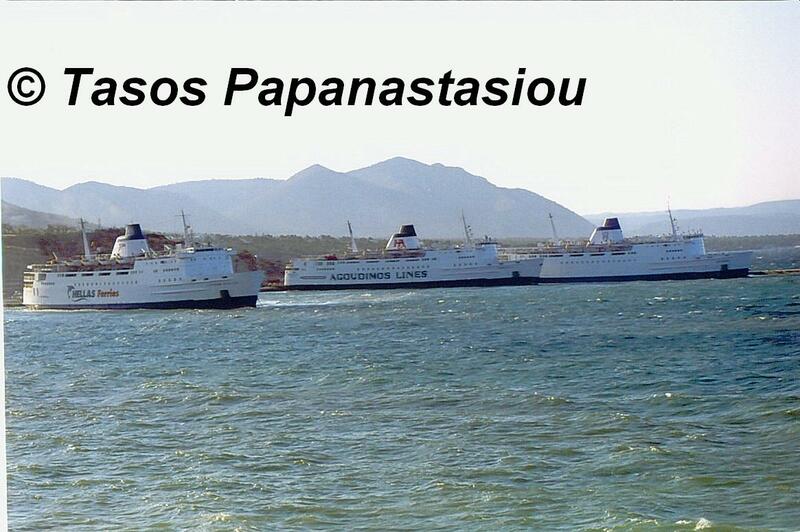 Image courtesy Tasos Papanastasiou. 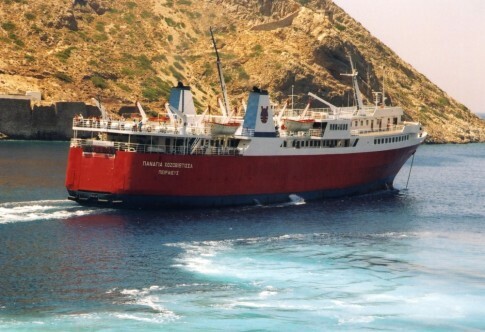 The Express Apollon is seen here at Santorini in 2005, her final Summer of Greek domestic operation and back on her original Greek route. This was shortly after she received the new blue hull Hellenic Seaways livery. 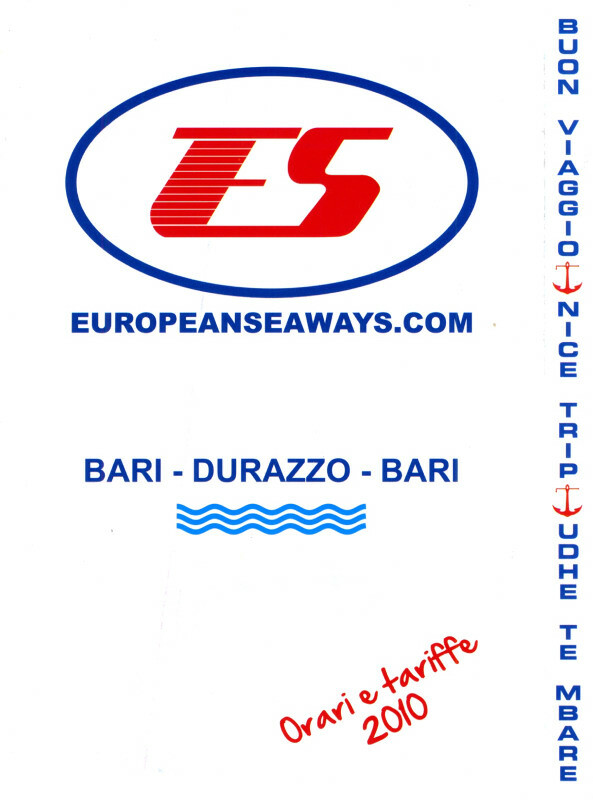 The cover of the 2010 European Seaways brochure - the ship's final season. 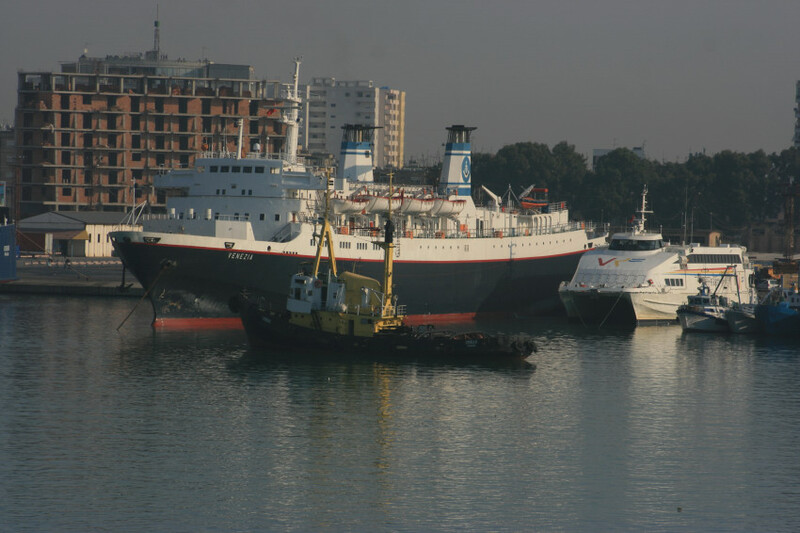 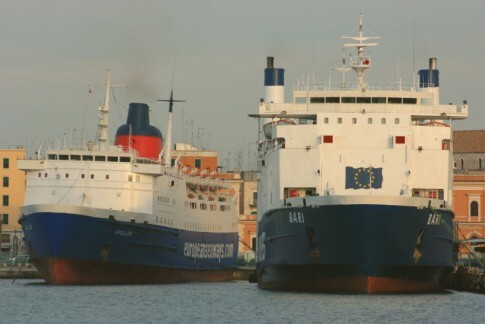 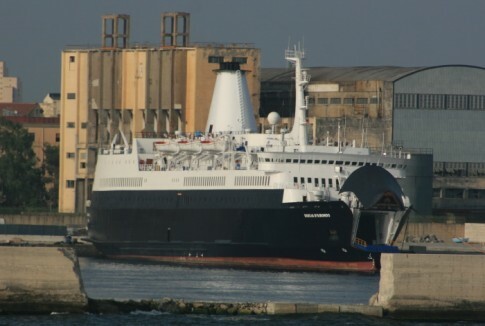 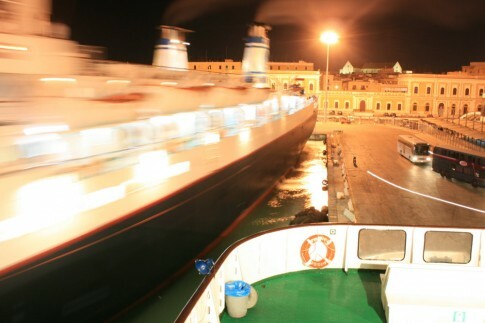 A final view - it is July 2010 and the Apollon is in Bari alongside a fellow former Newhaven-Dieppe ship, the Bari (ex-St Anselm/Stena Cambria). 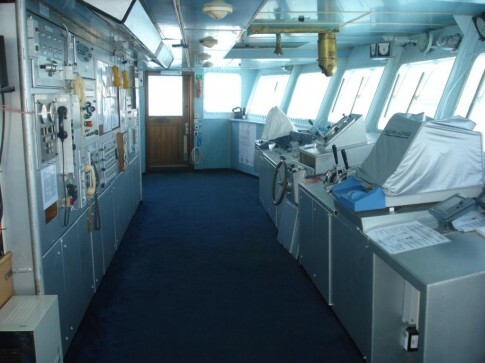 Designed by the same naval architects for the same operators and delivered just seven years apart, the evolution in design is striking. 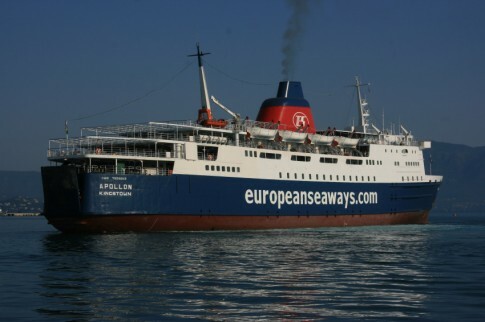 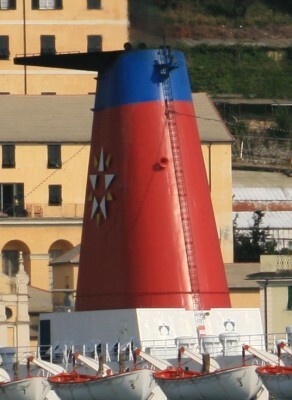 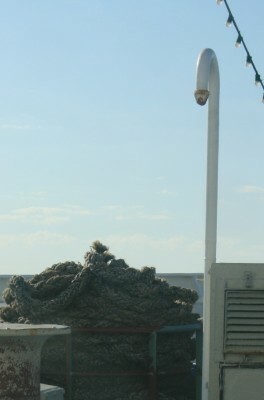 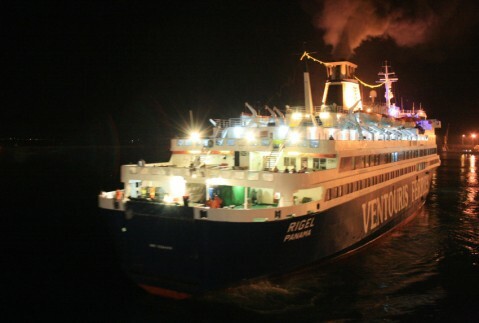 The St Anselm and her sisters were not however blessed with the trademark Sealink 'Rogan' funnel, seen here on the Apollon in 2007. 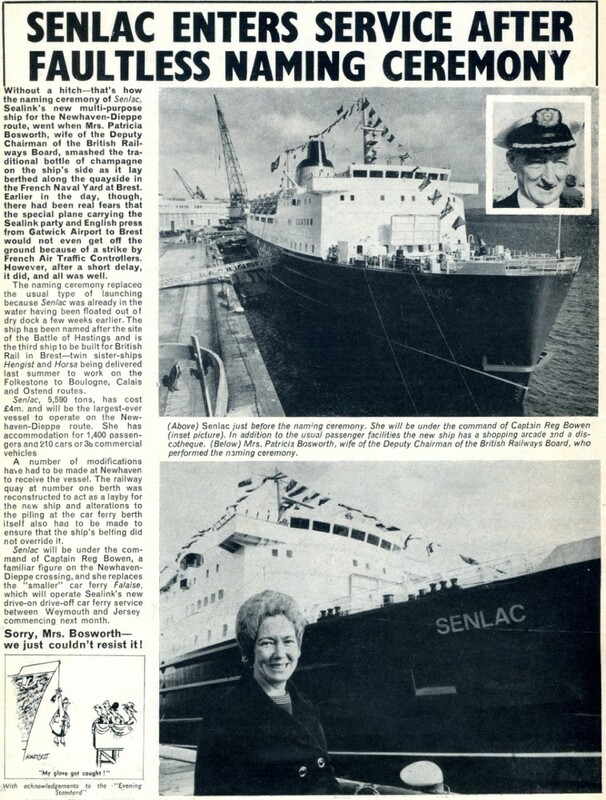 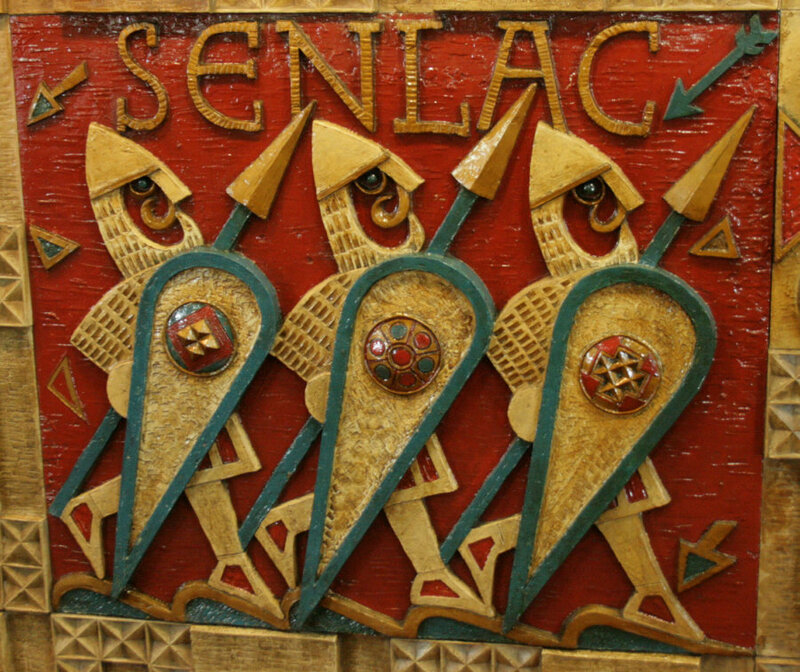 The many faces of the Senlac. The ship's bell - which disappeared after her final spell of Hellenic Seaways service in 2005. 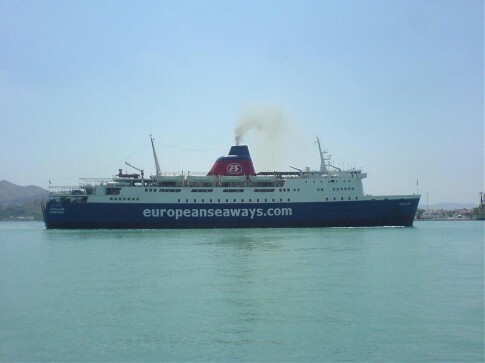 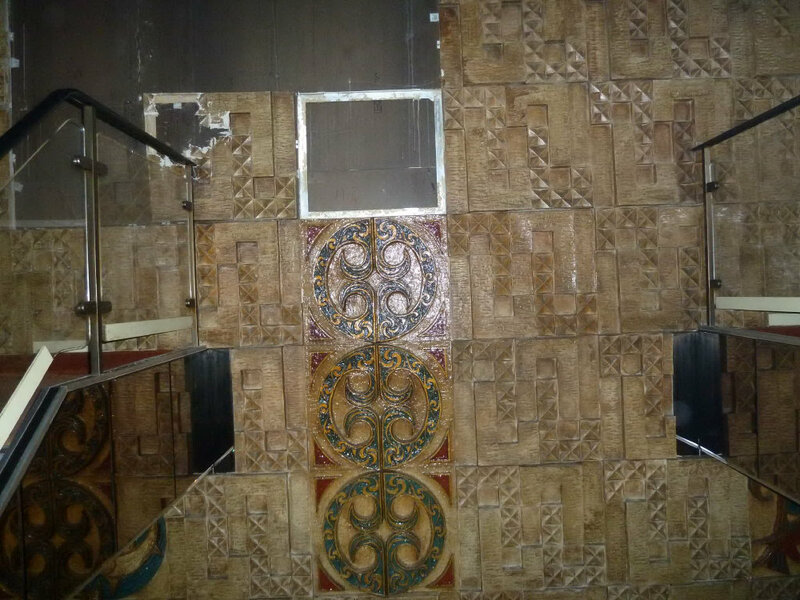 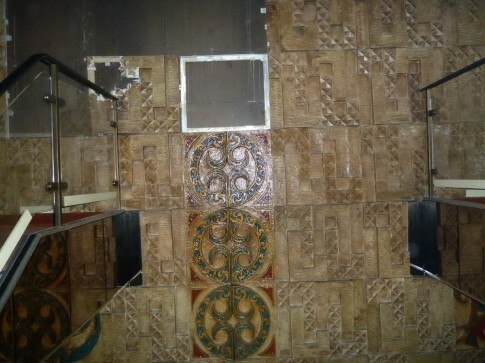 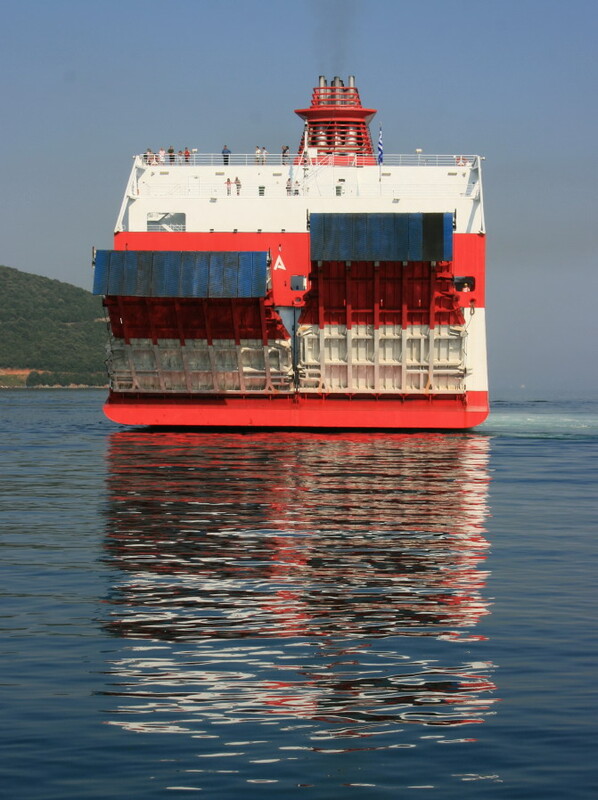 Nigel Best has come to the rescue to complete our update of the current status of the ‘H Boats’ with recent images, from owners European Seaways, of the Senlac, now the Apollon, operating between Bari and Durres. 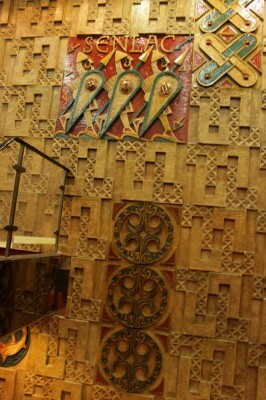 The Franta Belsky 'Senlac' mural at Boat Deck level. 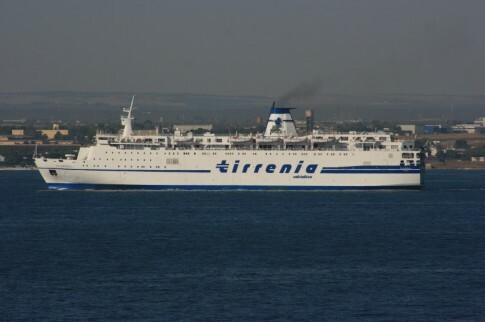 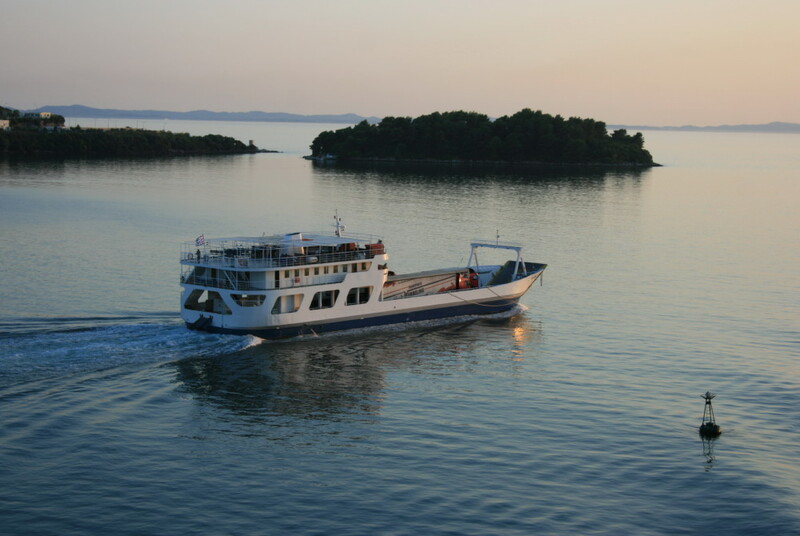 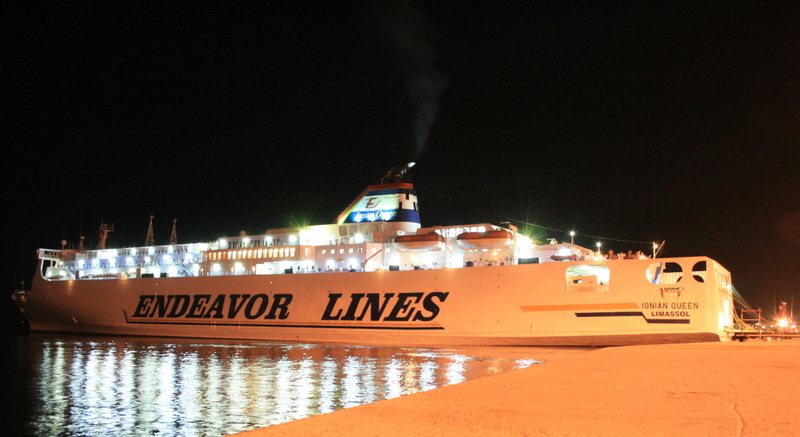 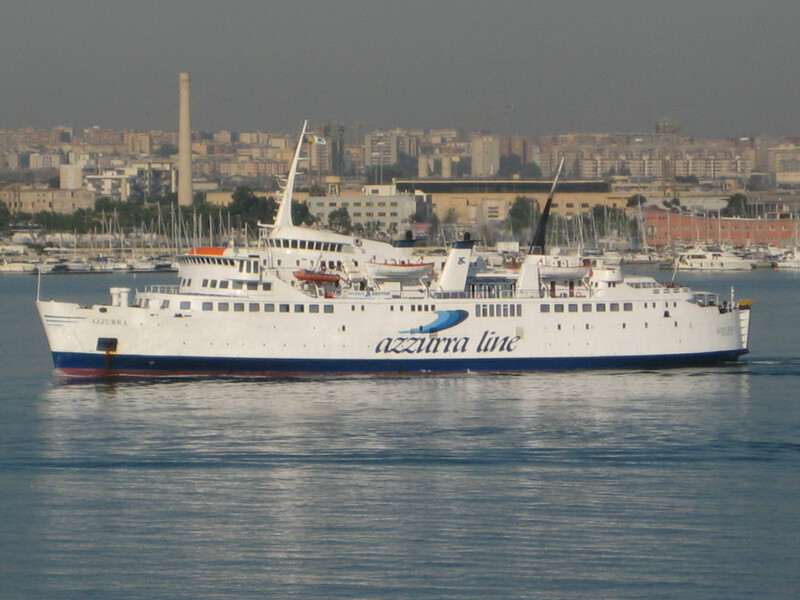 Adria Ferries: Riviera Adriatica. 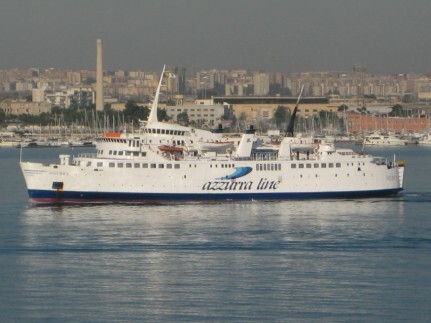 The Riviera del Conero (ex-Egitto Express) appears to be remaining exclusively on the company’s original route between Durres and Ancona this Summer. 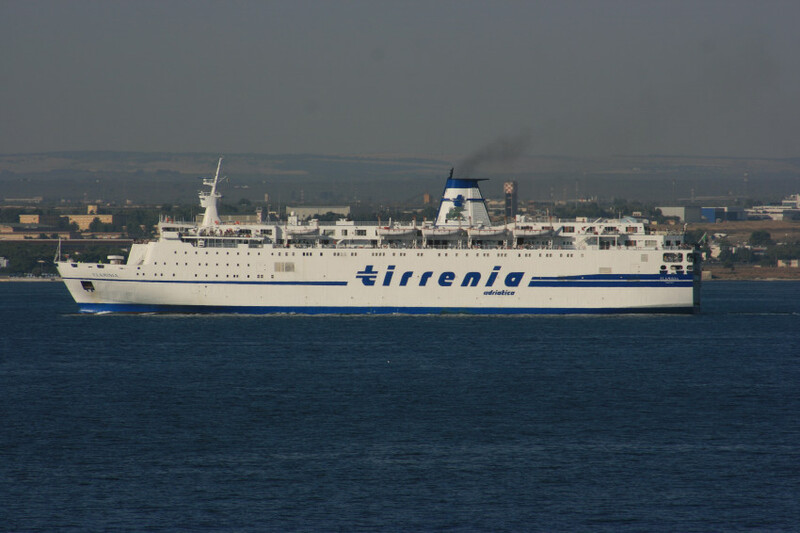 Not operating to Durres, but on an optimistic new route from Bari to Shengjin in Albania’s north are Azzurra Line and their peripatetic Azzurra. 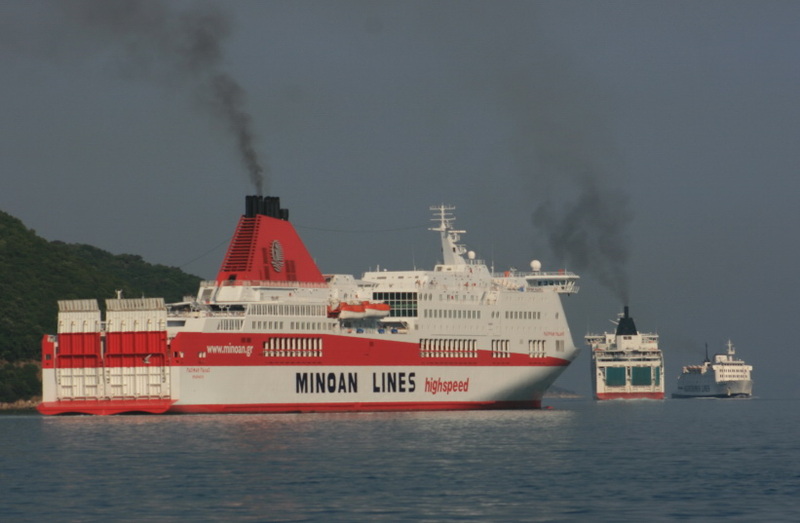 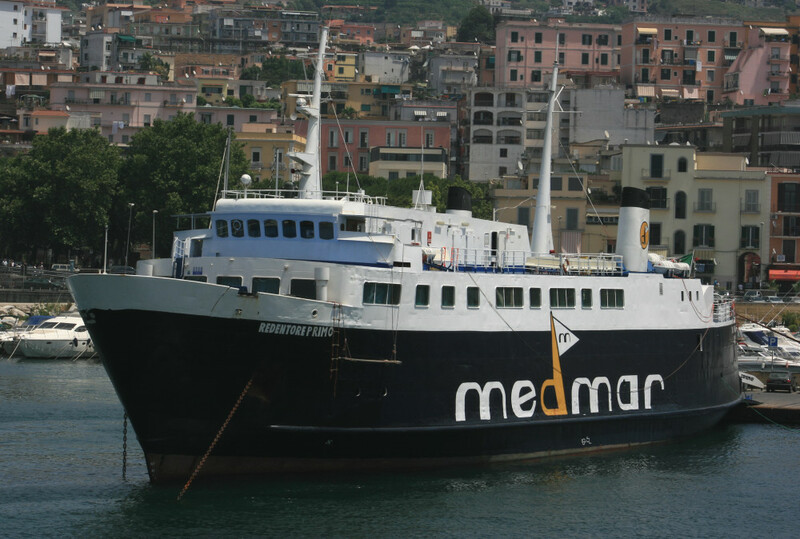 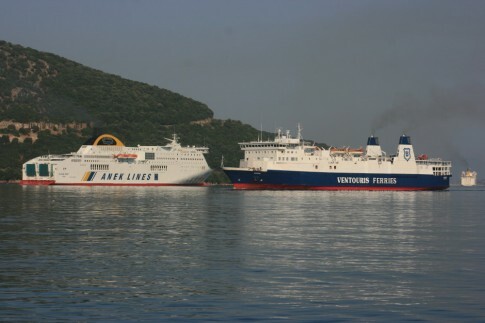 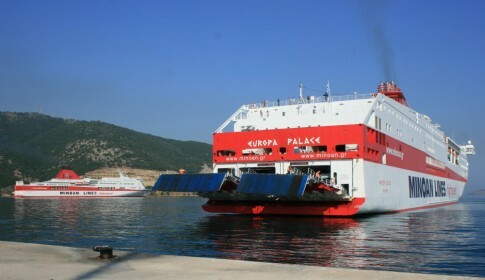 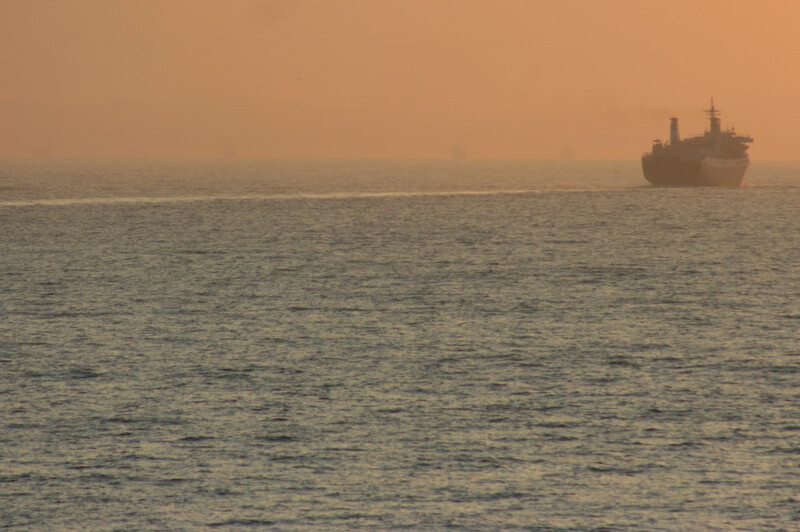 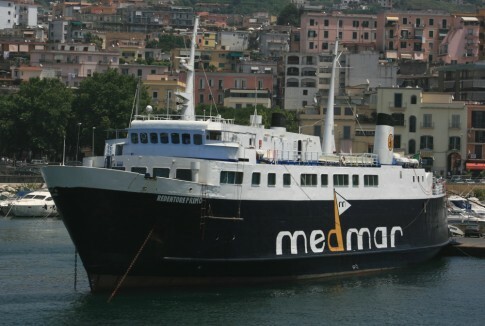 Down the coast on the parallel Brindisi-Vlore route the demise of the Kapetan Alexandros A has done little to change the nature of operations with Medglory Shipping’s Veronica Line and Red Stars‘ Red Star I competing with the Agoudimos replacement the Ionian Spirit. Although Red Star seem to be Skenderbeg Lines reborn, the latter’s name has joined Palmier Ferries, Rainbow Lines, Prosperity Navigation etc in defunct operators on this route. The Europa I remains in Brindisi, where she has been laid up now for more than a year after the failure of last year’s Otranto-Vlore operation. 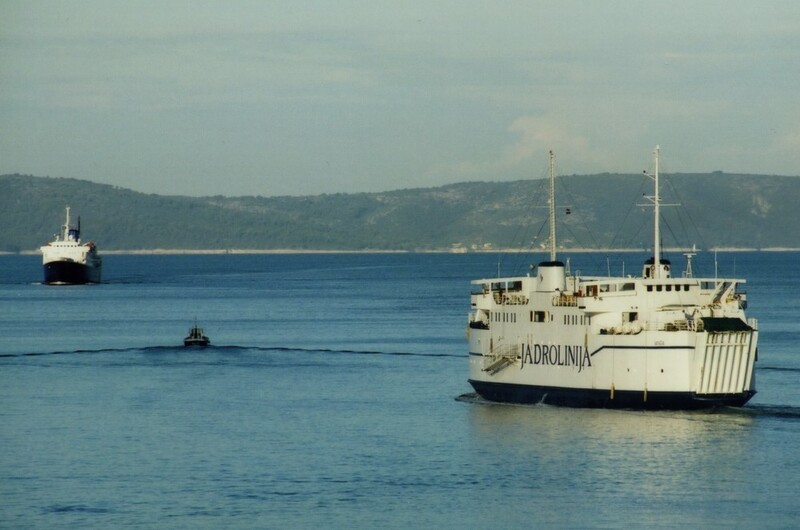 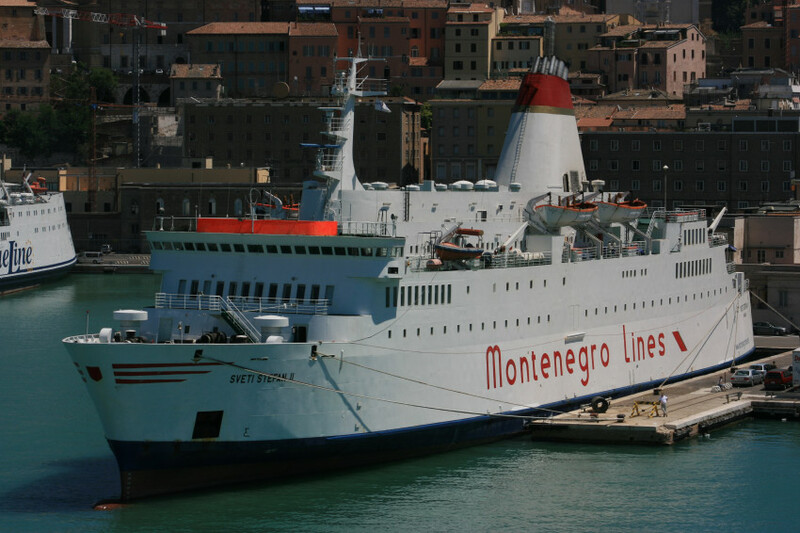 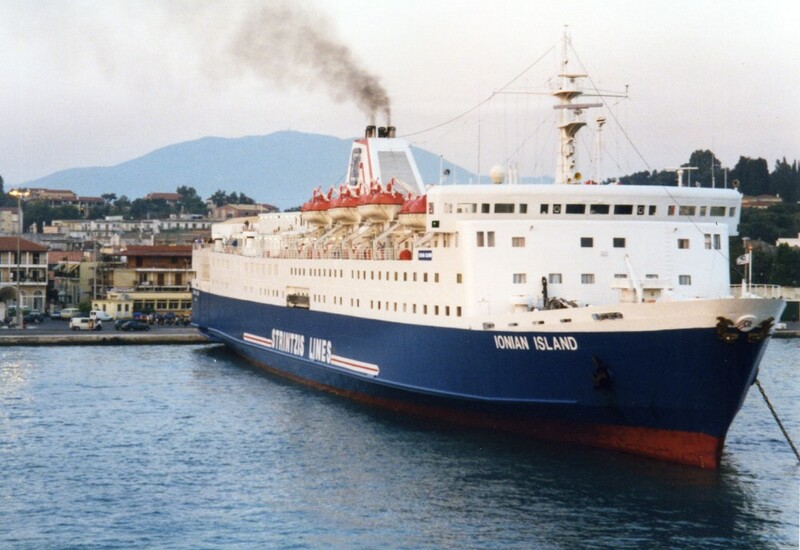 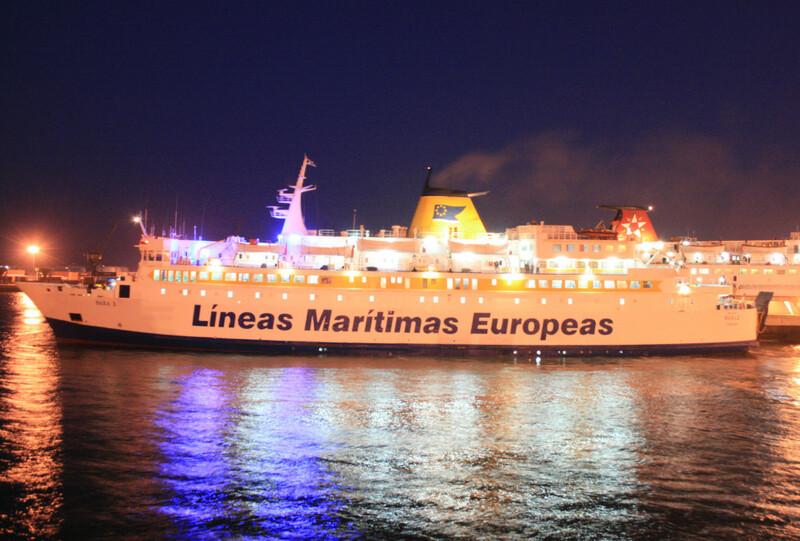 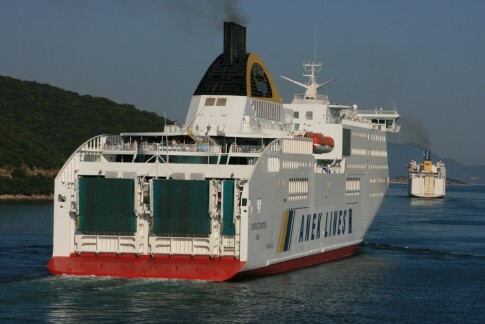 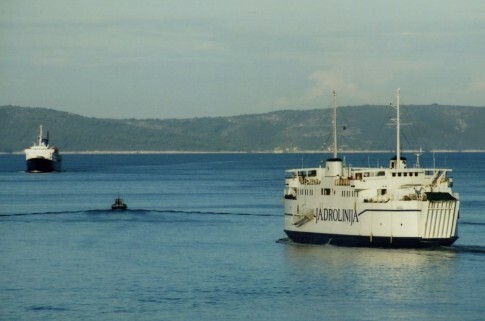 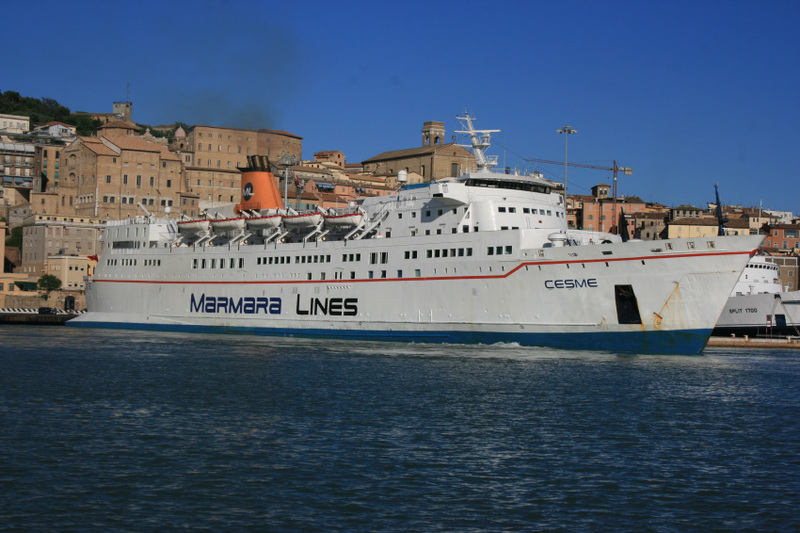 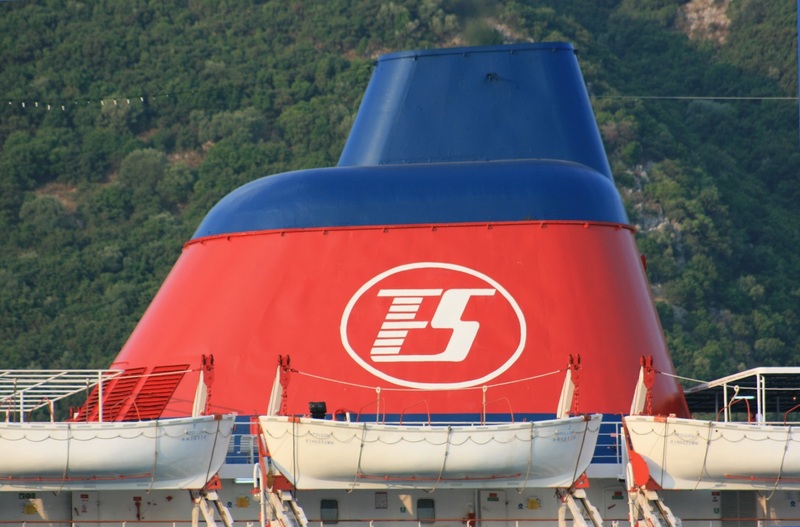 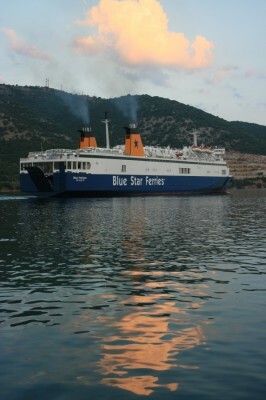 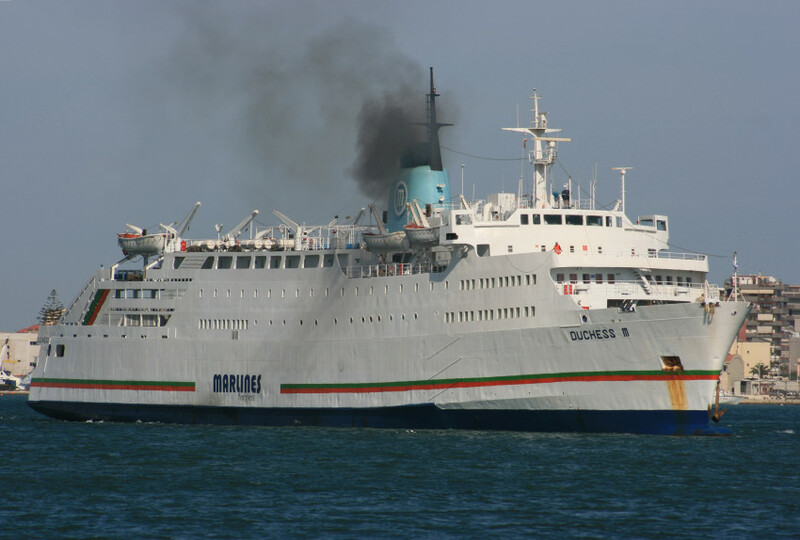 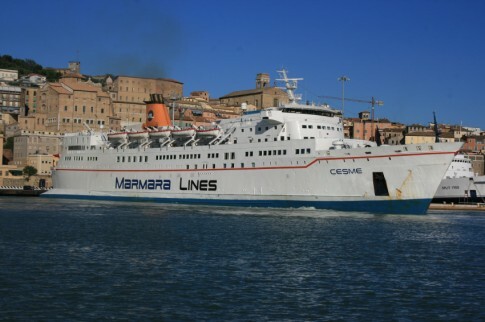 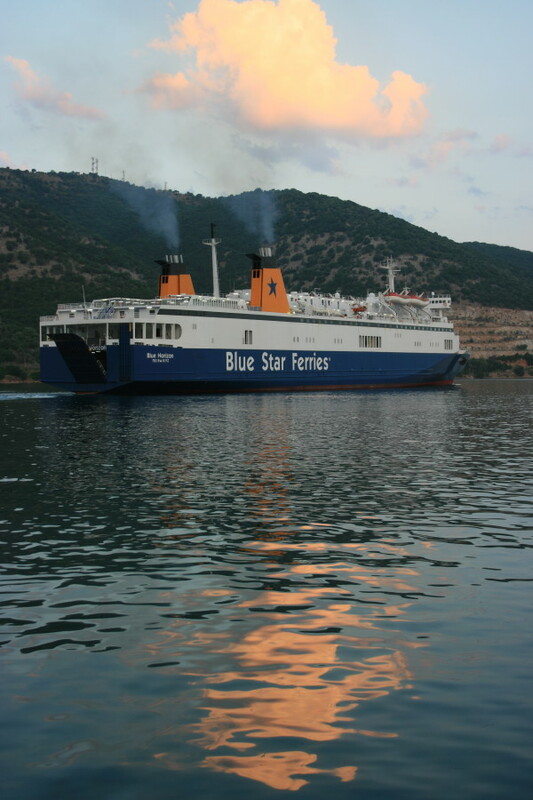 The most notable names missing from the list of Albanian operators are Marlines and their Duchess M, the former Breizh-Izel of Brittany Ferries. 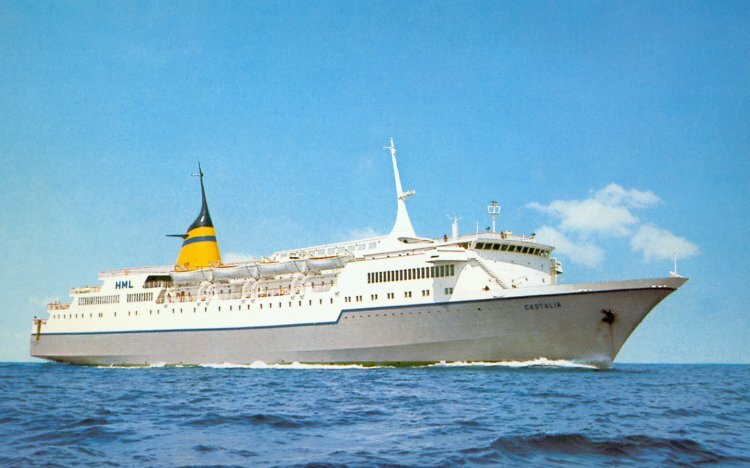 Marlines’ final years were a cruel betrayal of their glory days (pre-Superfast), but they seemed to have found a niche in a market more akin to the Greece-Italy routes of that halcyon era. 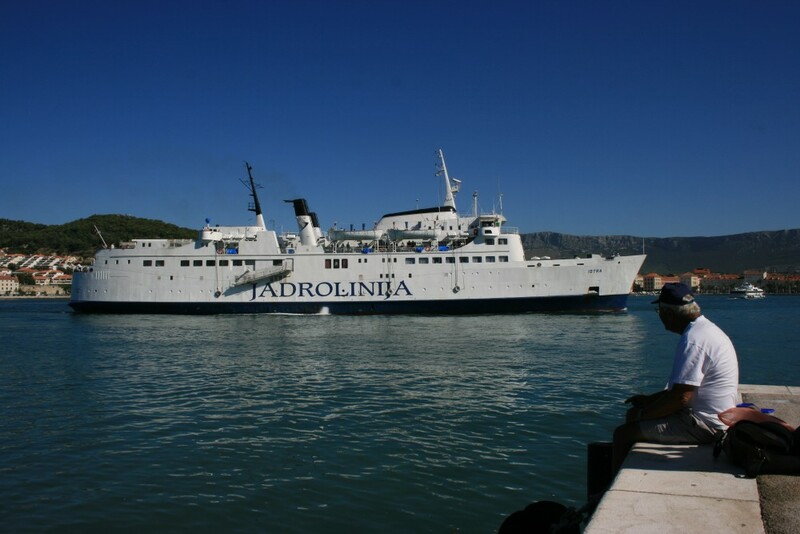 The company has not, however, returned for 2009 and so one must wonder if this is to be the end of another of the Adriatic’s most famous names, with HML and, to all intents and purposes, Adriatica already gone. 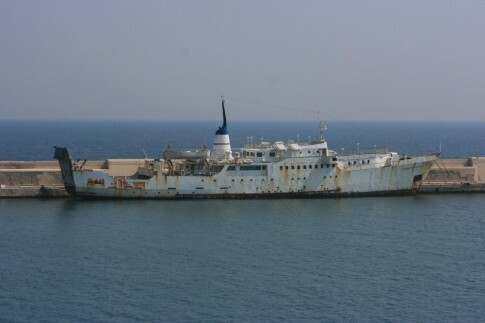 The Duchess M, for now, remains laid up in Elefsis. 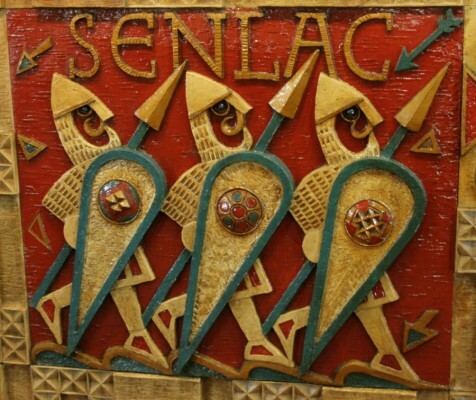 The future for the ex-Senlac is almost as uncertain. 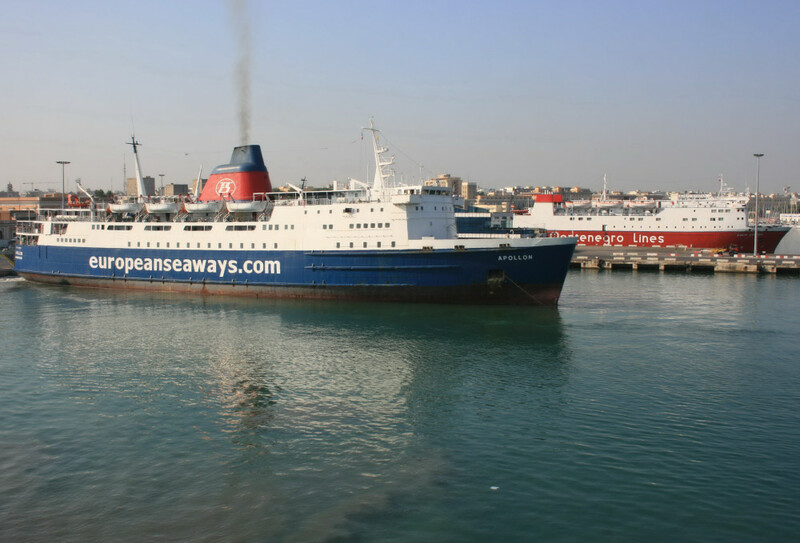 The Arkoumanis-controlled European Seaways have boldly expanded into the Durres market, from their first sailing less than ten months ago to now having a two-ship rolling schedule. Whether this has been a success or not time will tell, but for now the Apollon, the most original but also the most mechanically tender of the three Sealink sisters, continues to provide valuable service to one of the Adriatic market’s bottom feeders.